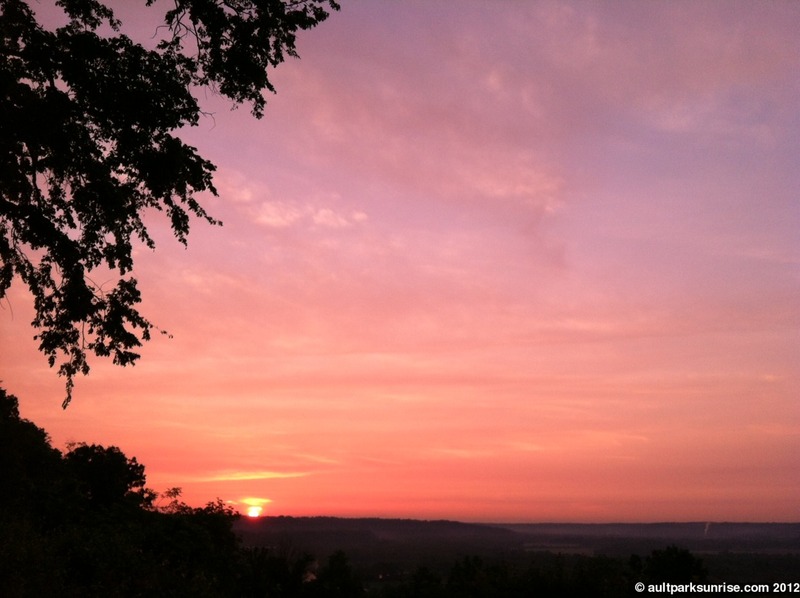 This morning’s sunrise was a prolonged session of pink and orange. 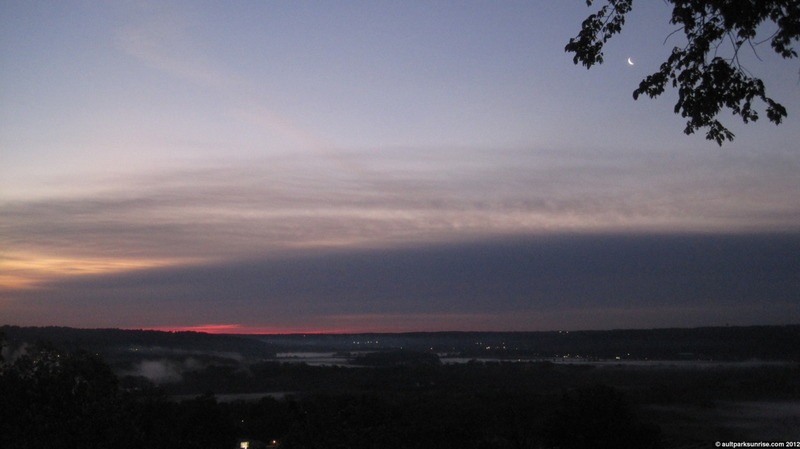 The temperature was a cool 60F and the distant hills were laced with light mist. 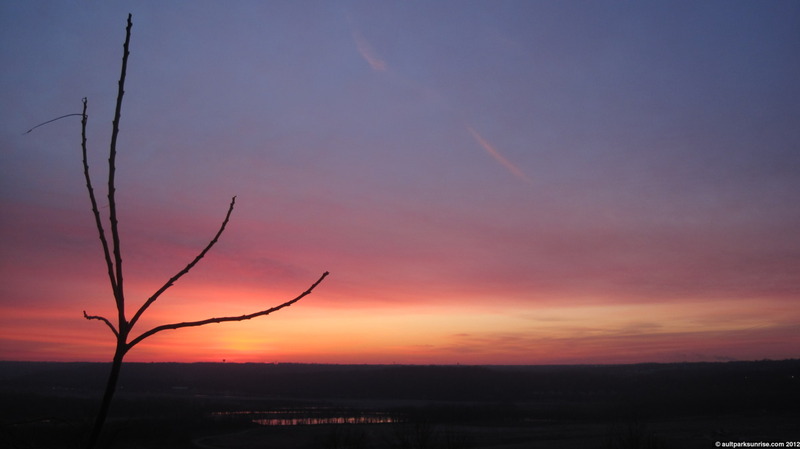 I was hoping for a bright pink sunrise like the kind we saw last week. 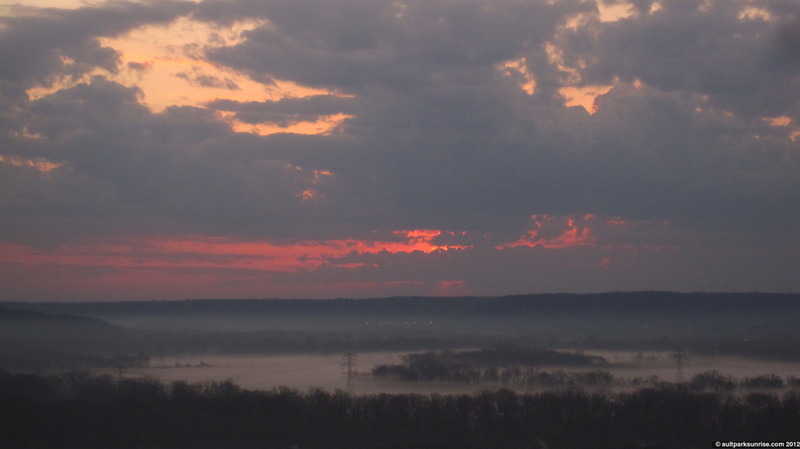 While the colors this morning were certainly bright, the palette had more orange than pink. The park was quiet this morning, too, which is surprising considering how active the birds have been over the last few days. I did see a single jogger in the park who stopped by to check out the sunrise, but other than that it was a solitary morning in the park. 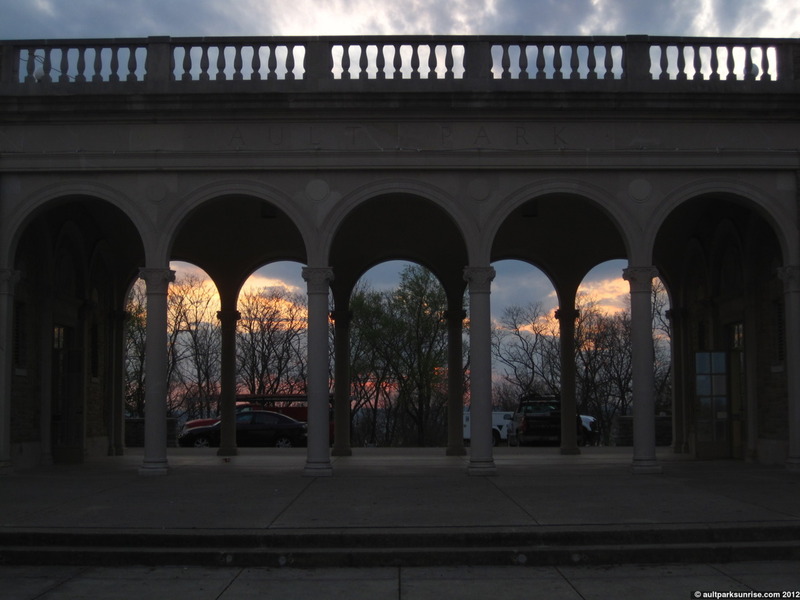 If you’re connected to Ault Park Sunrise’s facebook page, you are now aware that my camera recently broke and I’m in the market for a new one. I’m putting together postcards featuring various photos from the last year of the project. They’ll be available for purchase and the proceeds will be put towards some new hardware. The silver lining to my camera’s untimely death is that I now have a true motivation to organize and collect the photos from the last year. I’m hoping to have at least 5 different postcard designs, some featuring individual pictures and others featuring themed “montages”. I’ll have more information up soon, but if you’re interested be sure to keep your eye out! The other reason I mention the camera difficulty is because I’ve been trying to figure out how I’m going to be able to continue with the project until I get the new camera! My wife suggested that in the meantime I could use her phone to take pictures (mine is quite out of date and doesn’t take very good pictures). So this morning that’s what I did. The pictures didn’t turn out too bad at all, although I don’t have much control over color settings. The zoom and macro don’t work too well but hey, it’s better than nothing! Sunrise 164 was colorful and bright. 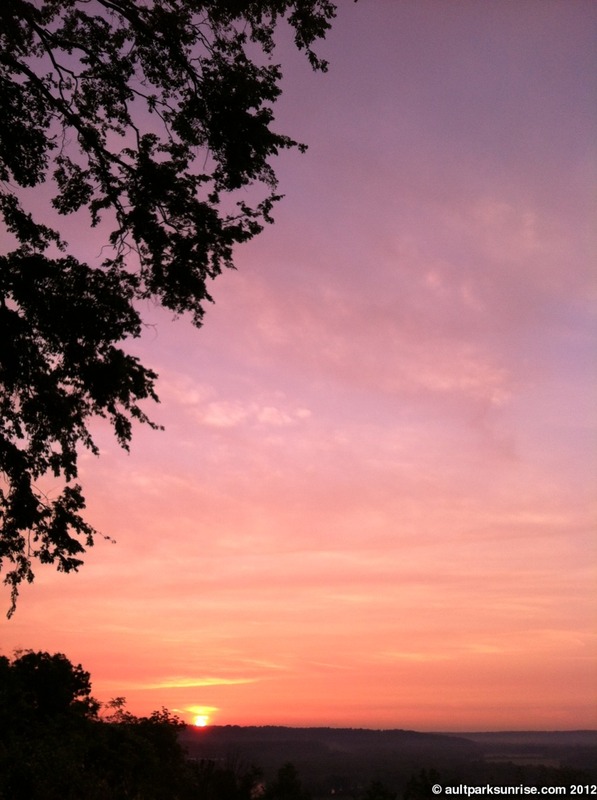 The humidity created a prolonged twilight that was filled with oranges and soft pinks. Interestingly, the pinks were subtle this time around, as opposed to the bright magenta that I would have expected. I believe the humidity has something to do with it. Here we see the young Tree of Heaven that is coming into full bloom! The flowers are white and the entire bouquet is rather large. Boy, it sure felt good to get back on the bike this morning. I’ve been so busy at work over the past two weeks that I haven’t been able to muster up the energy (or time) for some early morning sunrise rides. It’s an interesting thing because I recognize it as entirely my fault, but sometimes once you get into a habit it’s hard to break. After a late night yesterday and a surprise calm in the series of thunderstorms that came through the region, I decided that I just had to get out this morning. After painstakingly crawling out of bed (OK it wasn’t that bad!) 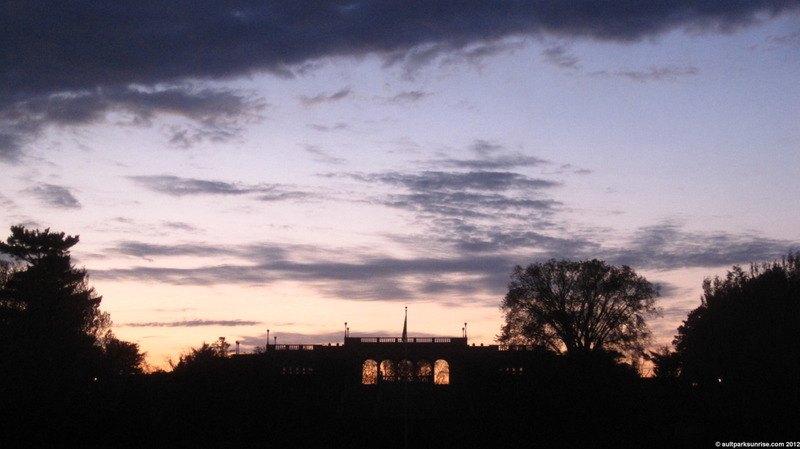 and seeing lightly scattered clouds in the early twilight sky, I set off towards the park through the misty streets. The air was warm and wet this morning. We had a chilly streak late last week with temperatures dropping down into the 40s again. Last night we saw a monster of a thunder storm and I’m going to take a wild guess and say it was a warm front. 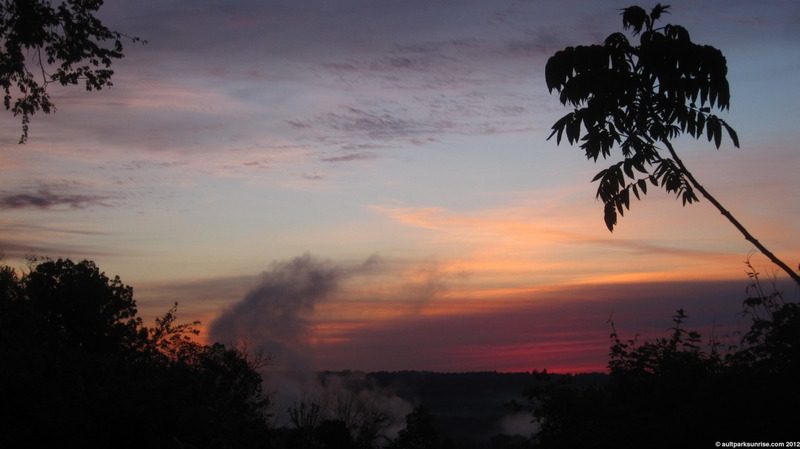 The clouds were puffy and humid at twilight and there was mist hanging around by the edges of the forest. A low lying cloud bank over the horizon blocked most of the pink twilight colors but made for a powerful moment when the sun peaked over the cloud bank about 5 minutes beyond day break. It’s always so surprising to me when I notice just how lush the forests around here are in the spring. On mornings like today, with the moisture on the pavement and the mist seeping out of the forest, the plants’ foliage seem like they are swollen with water. 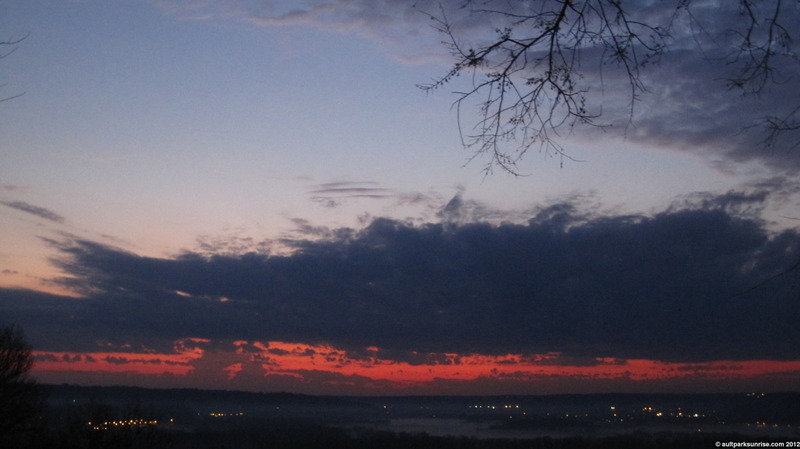 I almost feel claustrophobic at the overlook when I compare the view to the naked silhouettes of the winter sunrises. I’m sure our warm winter only helped to add a multiplier to the strength of the local foliage. I suspect we’ll have an intense kudzu season on our hands by the middle of summer. 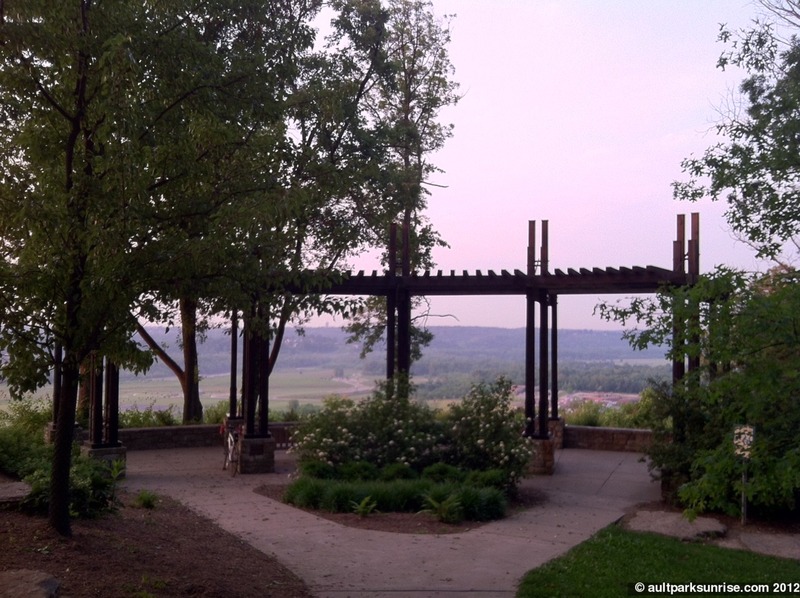 Here we see the young Tree of Heaven down by the overlook. At twilight the sky was opening up with light but the lower atmosphere was still rather dark due to the cloud bank that was blocking the early rays of twilight. In the far corner of the sky I could begin to make out the orange highlights that signified that the sun was beginning to rise behind the cloud bank far, far away. Rays of light started to burst from behind the clouds across the misty valley. Here we can catch a glimpse of them. A close up of the rays of light, jutting out from just beyond the lower cloud bank. 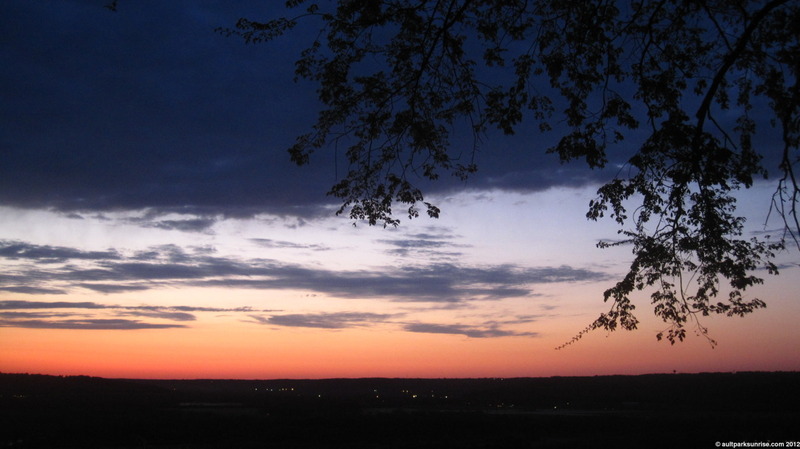 This view usually only lasts for a minute or so and is a sure sign that the sun is just around the corner. A vertical shot, showcasing the upper atmospheric shadows and open blue skies. What a beautiful morning it is, indeed. 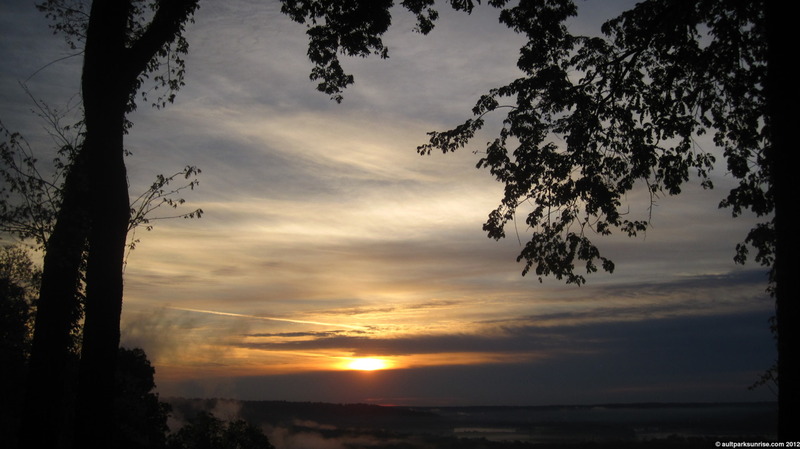 The lower overlook certainly provides the best viewpoint as we move into the May sunrise season. Daybreak came late this morning. Now that the sunrise time has crossed below the 7:00am threshold, it is easier for me to make a trip to the park without worrying as much about my morning schedule (I’ve been busy for the last few weeks!). The air was brisk this morning at 44F, a temperature that I only just now realized. I thought it was nippy but without a breeze it felt warmer than it really was! 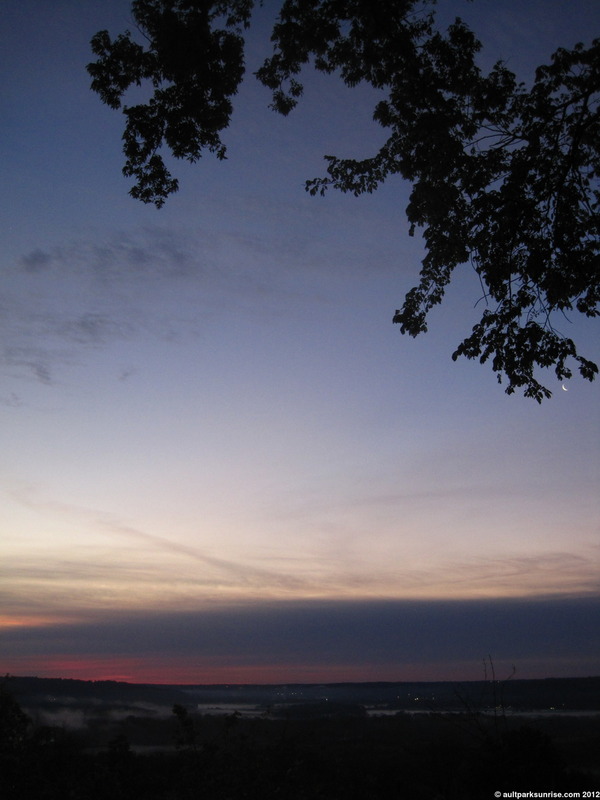 Armed with hot coffee and my bike, I found myself up at the park about a half hour before sunrise. The colors this morning were beautiful. Mixing them with a dynamic true spring atmosphere (we had big storms yesterday) made for a swirling concoction of twilight cloud cover. There was a low lying cloud bank that blocked the sun for a few moments, but it eventually swept into the distance and allowed the sunlight to come through across the horizon. 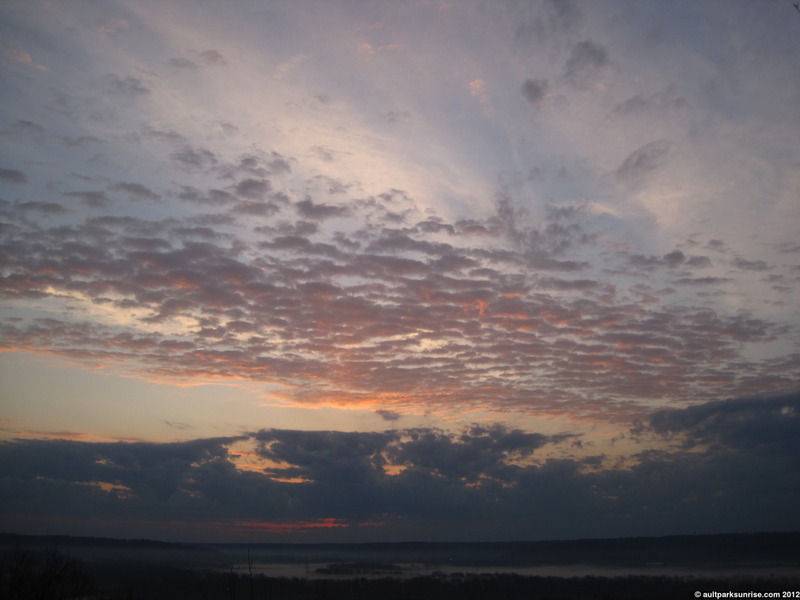 Unlike the summer and autumn sunrises, where the sky is crystal clear and the atmosphere lights up an hour before sunrise, these spring sunrises are humid in a sky full of obstacles. 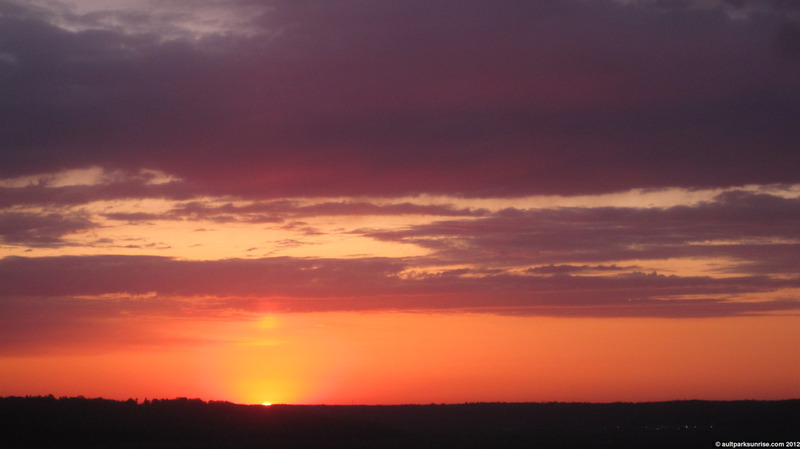 This morning’s sunrise didn’t hit peak colors until just 10 minutes before day break, which helps explain why I was so caught off guard by finding out that the summer’s sunrise starts much more early than I was used to. 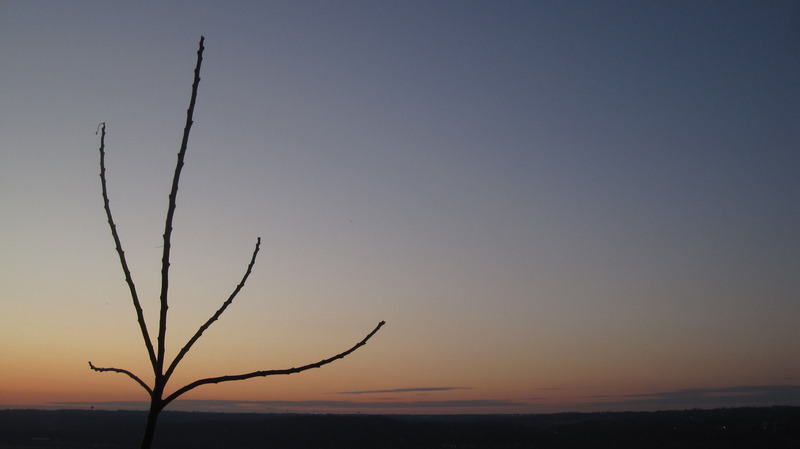 I visited my old friend, the Tree of Heaven down at the lower overlook. She is full of spring life and, to my surprise, made for another beautiful silhouette against the sunrise that has moved into the left most part of the horizon. 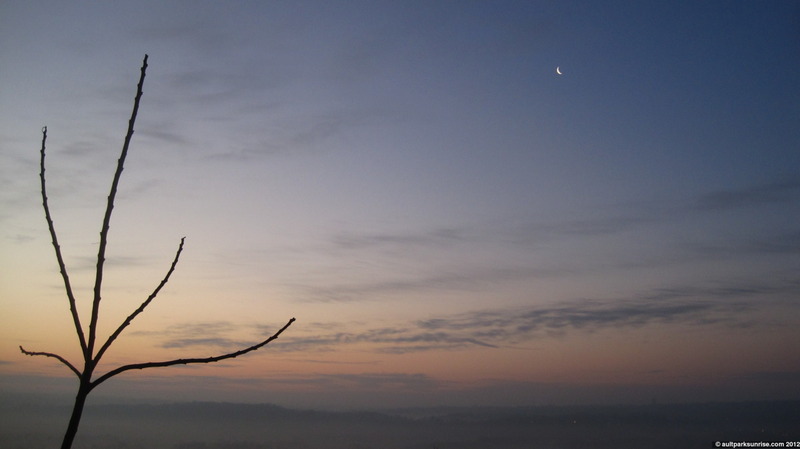 I had thought that maybe I wouldn’t be using the young tree as a sunrise subject until next winter (when the sun has moved back across the sky to be directly behind her) but was wrong. Arriving at the park, the crescent moon hangs low in the sky and the colors are just getting started. 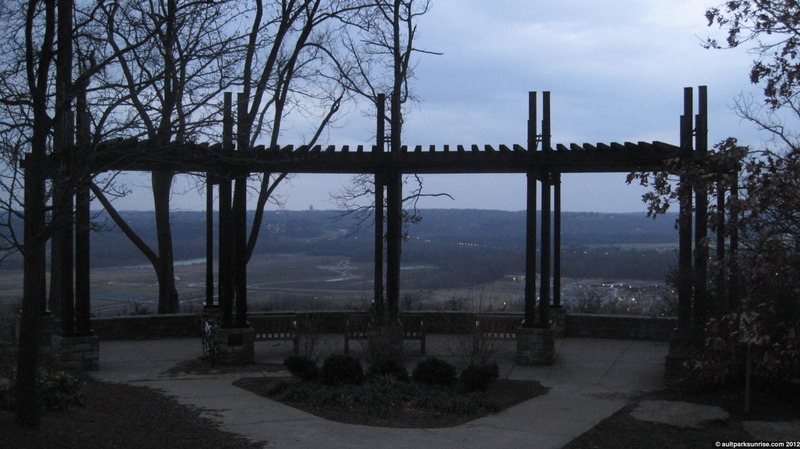 Heekin Overlook is dark and chilly and we can see a light fog sitting down in the valley behind. 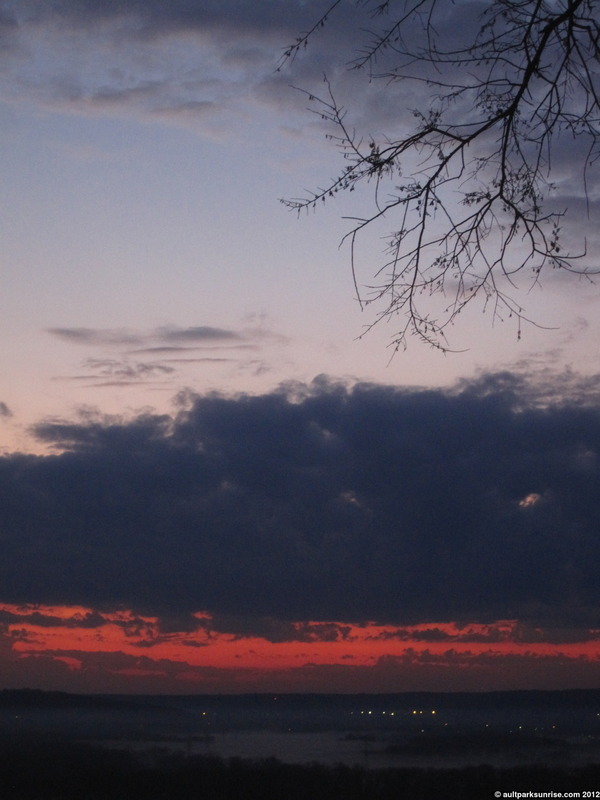 I was worried at first that the cloud bank may block all of the best colors, but that worry soon faded. 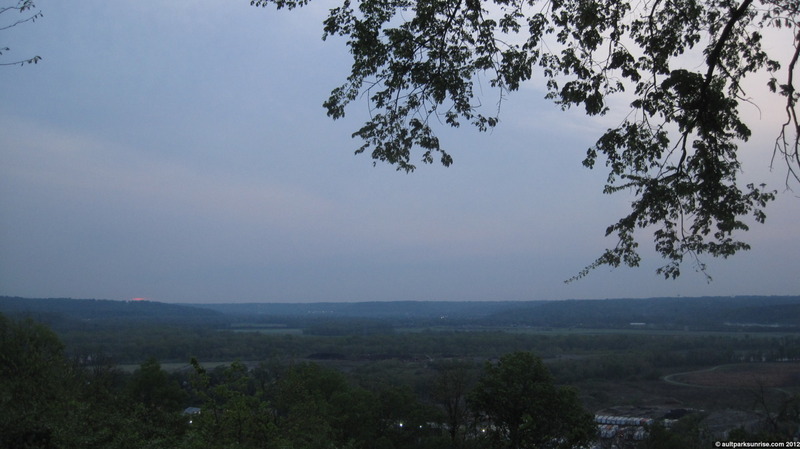 Heading down to the lower overlook to get a better vantage point, I see that there is more light over to the left. Has the sun really moved *that* far already? 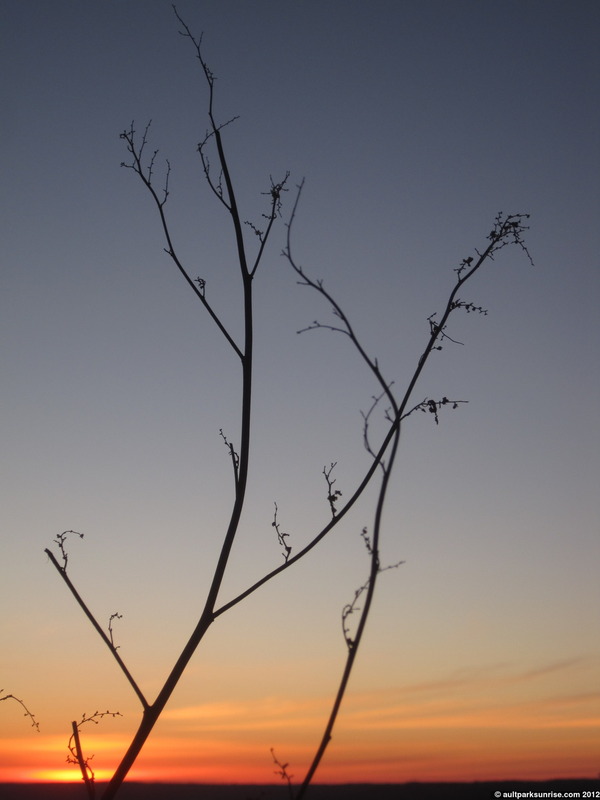 This left-most branch of the young Tree of Heaven was mostly ignored by myself during the series of silhouettes (see below). 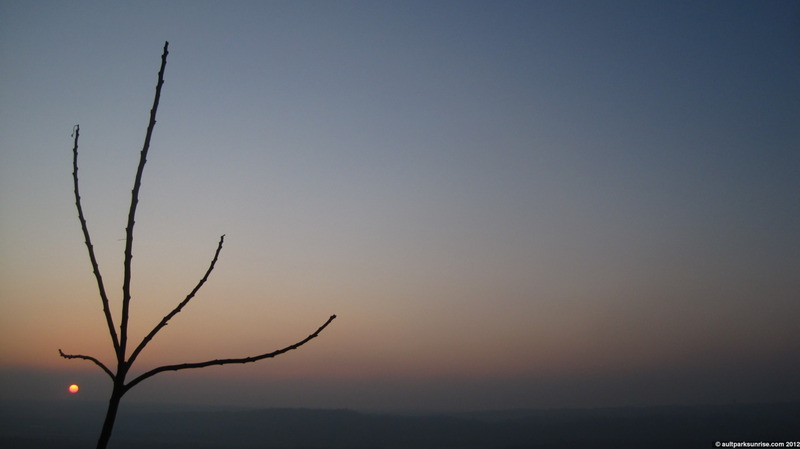 Now, with the sun having moved across the horizon, I find that it is making an excellent silhouette subject of its own. For the rest of the pictures, 14 total this morning, please click to continue if you’re on the front page. 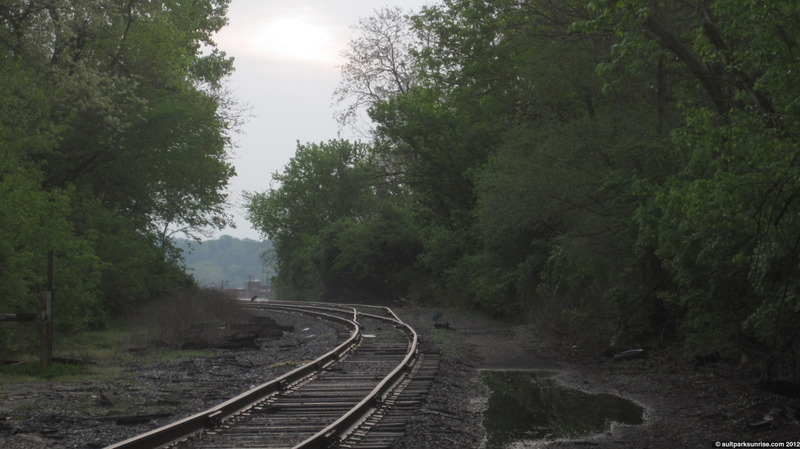 A somewhat abandoned rail line runs along the Ohio River, connecting ancient industrial sites that are now mostly defunct. More than likely this rail line’s destiny is to end up as a bike trail, connecting parts of Eastern Cincinnati for a new kind of traffic. Ironically, this is the same line that would have ran through R.K. LeBlond’s old East End factory to deliver raw parts for his gun lathe machining. 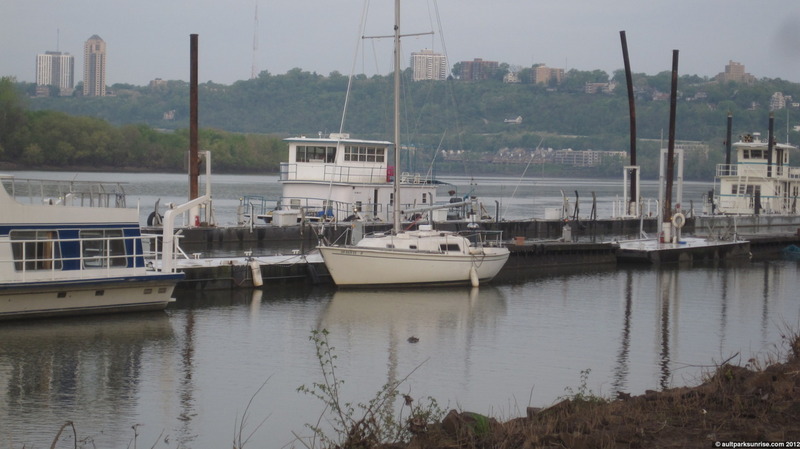 Boats hangin’ out at the Ohio River Launch Club on the river. 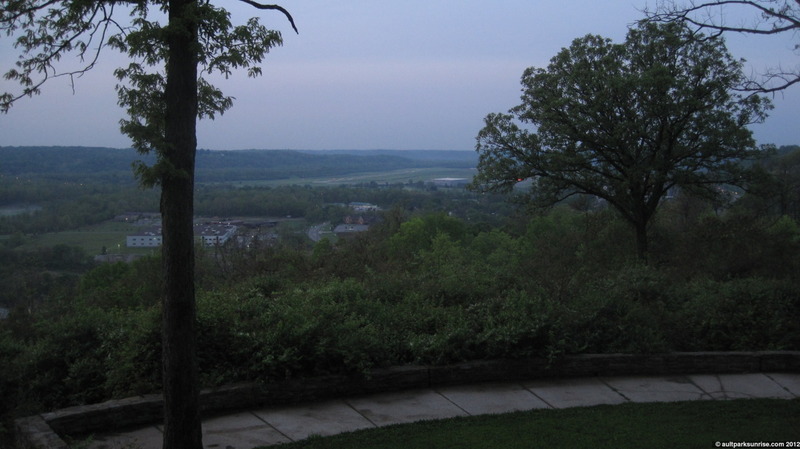 In the backdrop we see the hills of Eastern Cincinnati across the “Bend in the River”. 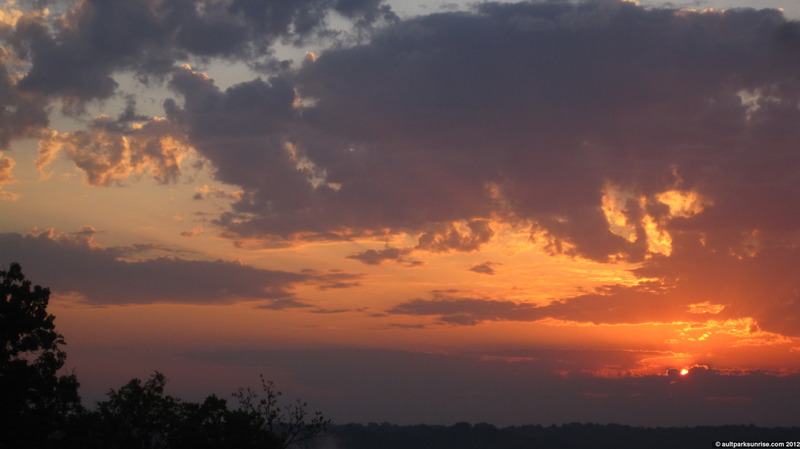 In honor of the 160th sunrise (4x the original project goal!) and our newly arrived spring season, I’m proud to say that we have something special today. This morning’s post features a guest writing from a friend. Jim Coyne is a freelance writer and life enthusiast. Jim has several projects he is involved with, including a book schedule for release in 2012 titled Wild Harmony, “That’s what I Believe” podcast, and a blog where he documents his travels and experiences as he explores our relationship between life, experience, and nature. 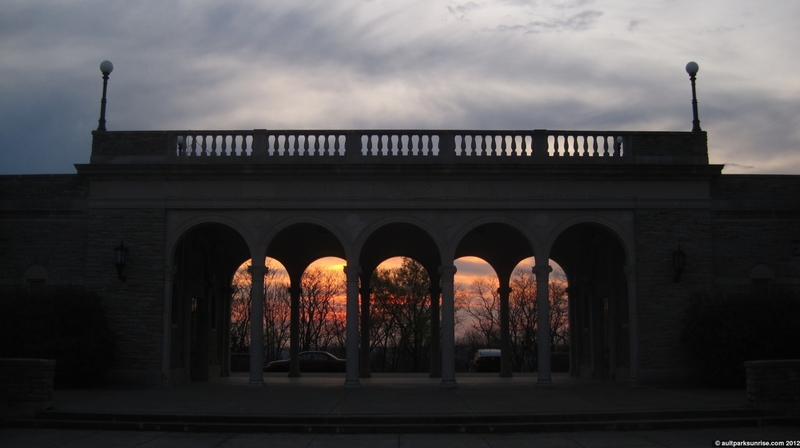 I asked Jim a few months back if he’s like to write an article (or do a collaboration) relating to Ault Park Sunrise. I hadn’t heard much about it after we originally talked, but then out of the blue on the first day of Spring I received the following written piece from Jim. If it resonates with you be sure to check out Jim’s homepage & podcast (url below). Spring is now. Ideas will be flowing and with the appropriate people, greater action. I wonder if time flies faster during the darker months of winter. We spend too much time indoors and come up with as many rationalizations as possible to stay away from the chilly day. Like the cave people of old, we forget the progression of the sun and fall into a routine of indiscriminate acts. There is less inspiration to be found and less motivation under a roof. Ken Kesey spoke of the graduation from the acid tests in Tom Wolfe’s The Electric Kool-Aid Acid Test. I am certain most people misunderstood his intent. Far too many get stuck in their ways, forgetting what works and what does not. What Kesey was really getting at was that we needed to move on from the introspection and live life through the greatest imaginations of past experience. Instead of repeating what others have done or going to the same vacation destination, why not turn 180 degrees and move forward? Some other people may say such an act is moving backwards. Hardly anything comes from listening to what others are saying. They are not at fault. Do not take it personal. Whenever someone sees another heading toward something which appears out of reach to them, they discourage their movement. Even if it is positive criticism or a warning not to make the mistake others have made, they do all they can to dissuade that person from continuing on a new path. All these conflicting voices lead an individual to desperate confusion. That person then stretches out on the couch and curses all that may have caused the status quo. What use is that? 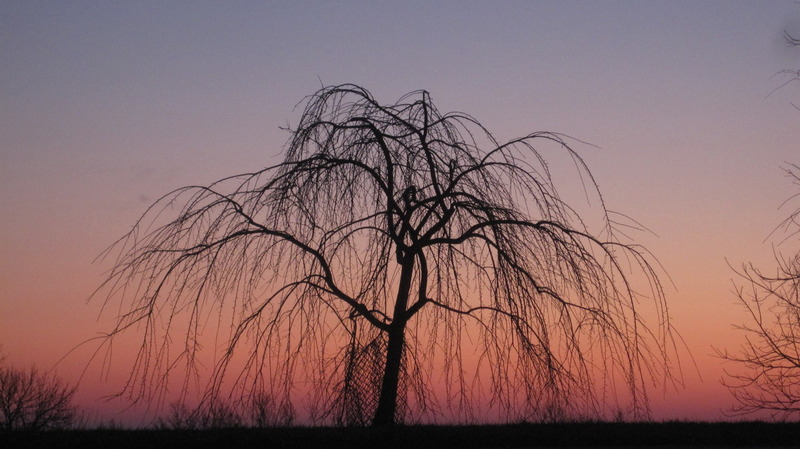 Will a great feeling come from being still? Absolument pas! Get up and go outside immediately. There are no more excuses. Kesey wanted people to move on from the drug fueled lifestyle. Instead of seeking truth in the mental perturbations that come with lysergic acid diethylamide, realize the present moment and the natural beauty of possibilities. Think of how much is out there that will never be discovered by humans. The dark limitless universe through the blue sky of day on Earth. The tiny molecular cracks in the ground which may hold greater artistic value than any museum painting. 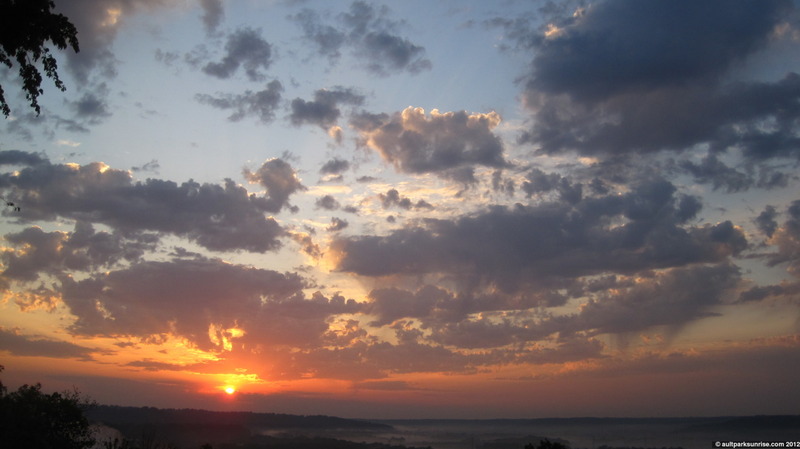 Let the sunrises of each morning spark a creative and thoughtful life. 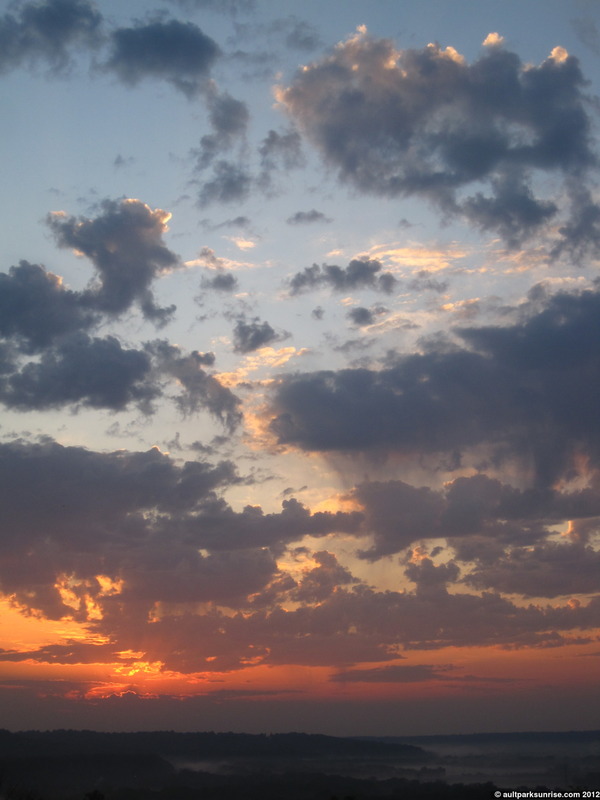 Gaze upon the horizon as it grows in bright hues and spectacular revelation. Accept that you will not be able to witness it all at once. Relax and realize how fortunate you are to be standing amongst such a magnificent feat of the natural world. Take another moment and prepare for the day ahead with a firm grip on what you are doing. Who cares what sounds realistic? Whatever wild thought comes to mind, go with it. 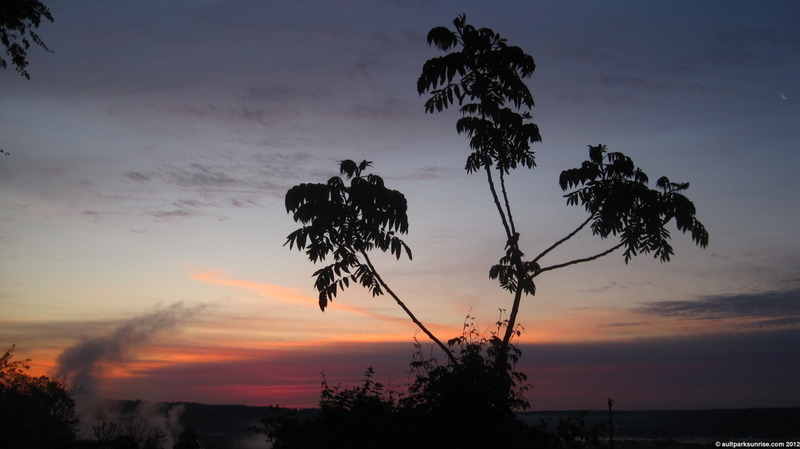 Even better, share the idea with another person or at least tell them about the sunrise which spurred the line of thinking. Then act. This morning’s sunrise was, I’ll admit, quite boring. After missing one of the most vibrant twilight displays (I was 10 minutes too late after setting my alarm incorrectly!) 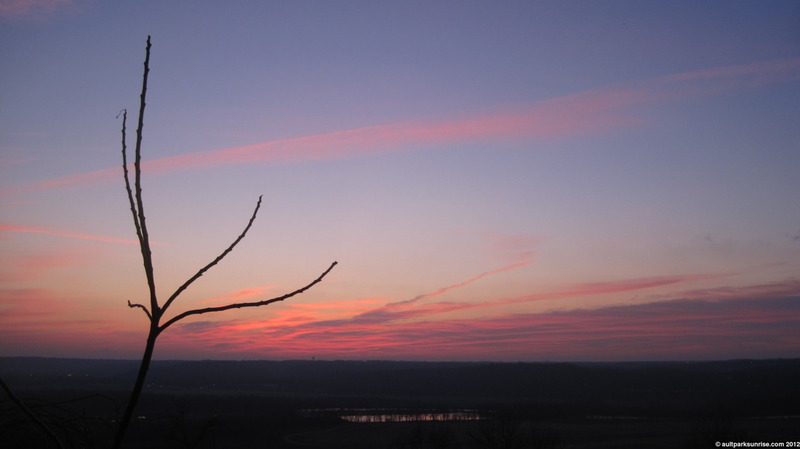 that featured pink and orange bands racing through the eastern sky, I had great hopes for a colorful sunrise. The misty and wet atmosphere created this thick haze that for whatever reason lit up the sky in early twilight but snuffed out the colors as sunrise approached. I realized rather quickly that the sunrise was going to be non-existent, so I set off to explore the lower valley and the Linwood / East End area on the way to Lunken Airfield. 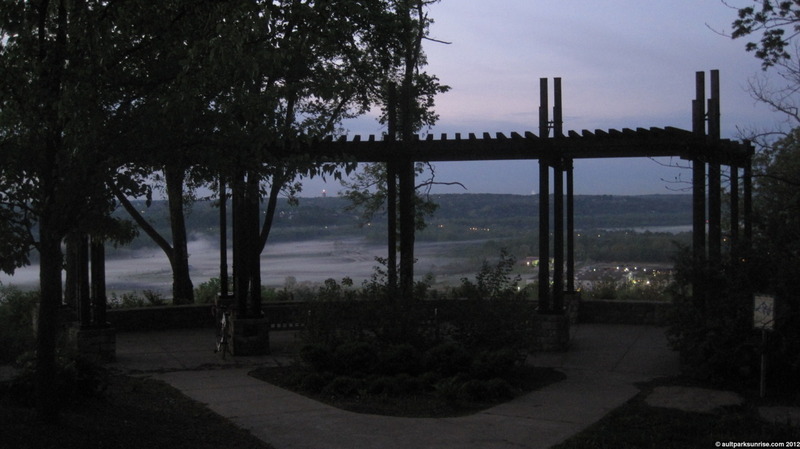 Inspired by Jim’s writing and the 160th sunrise post, I found it rather fitting that I would find myself exploring some familiar areas along the quiet streets running through Little Miami & Ohio River valleys. After an impressive twilight display, the only sunrise colors we got were a small pink highlight. You can see it over there on the left. Considering the route I am about to embark on, I look out across the valley towards Lunken Airfield. In 20 short minutes I will have descended down into the valley and made it to my destination. 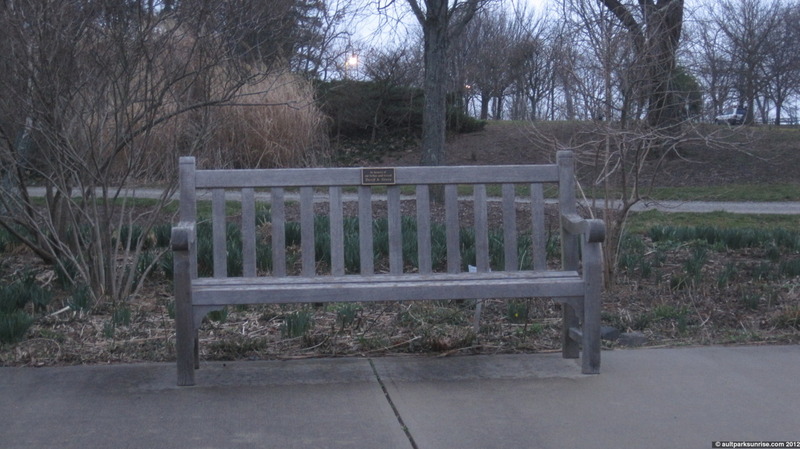 You can almost see the bench that sits by the Lunken trail through the dark, warm, and misty atmosphere. 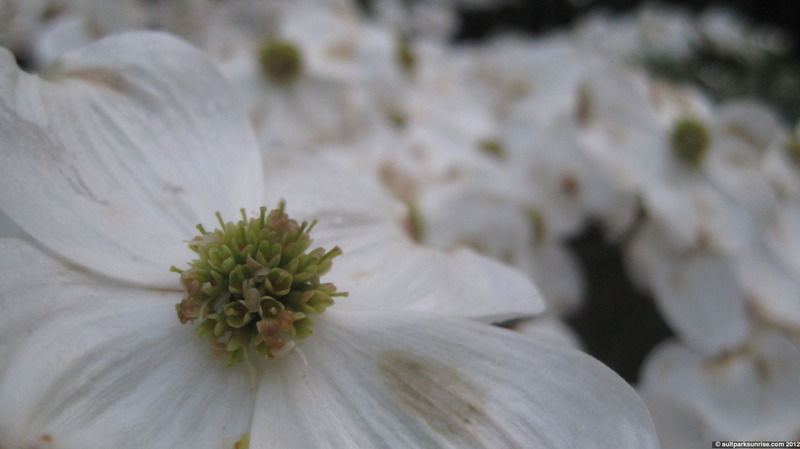 The recent rainstorm has battered the small dogwood blooms in the park. I am finding myself drawn to the dogwood trees this spring. They’re colorful and smell great, and I really like how the tree creates these groupings of flat flowering branches. Rather than bunch up in somewhat of a sphere, the flowers align themselves along a plane parallel to the ground. It’s an aesthetically pleasing effect. 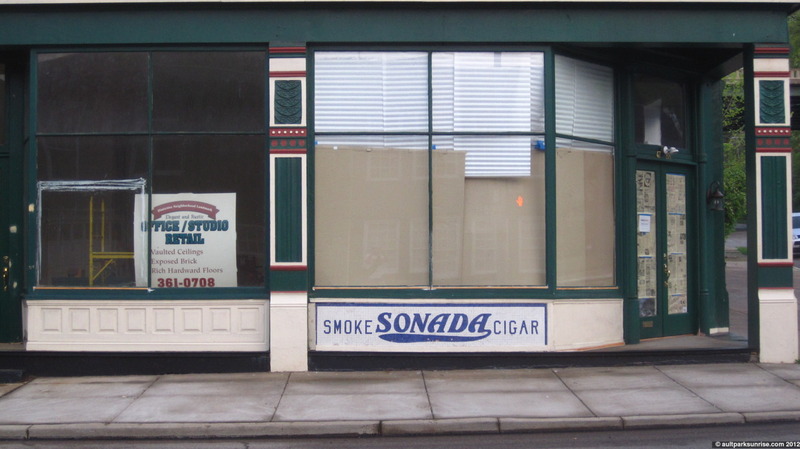 After dropping down into old Linwood, a village that has all but disappeared as an independent entity after slowly being absorbed by the the urban residential expansion of Eastern Cincinnati in the past century, I stopped to ponder once again this Sonada Cigar mosaic. I have explored the history of this mosaic in another sunrise post but still have not gotten to the bottom of it. The mosaic is old, that’s for sure, but even three years ago (before this building’s renovation) Google Street View shows that this mosaic was not present. Where it originally came from, and why it’s now here I have no idea. It’s beautiful though! It also looks like someone is getting the inside ready for business! 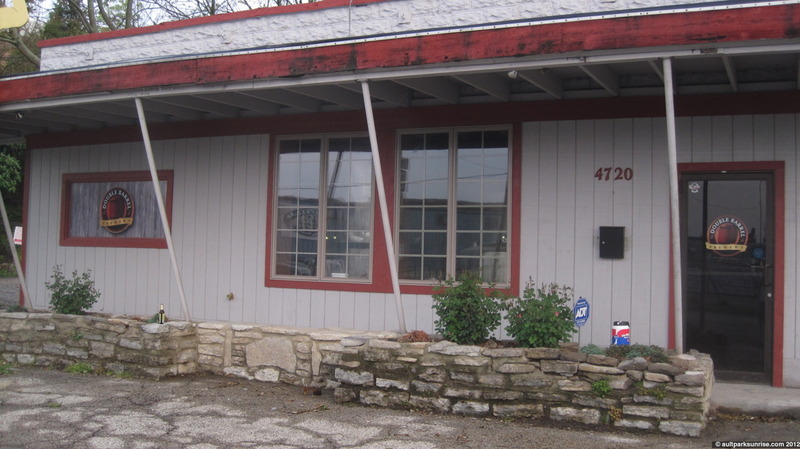 Continuing down Eastern Ave, we come across Double Barrel Brewing Co. This is a brand new brewery that hasn’t opened yet. I can’t wait! This beautiful sidewalk chalk art adorns the walkway in front of Ault Park’s central lawn on this one-year anniversary of Ault Park Sunrise. A spring sunrise tribute to the celestial titans? An innocent piece of work created by a young artist on a lazy Easter Sunday? Perhaps a professional installation done by a world master! Another mystery that will likely never be resolved. Seriously, though, it’s a pretty neat piece of work. Well done mysterious Cincinnatian artist! 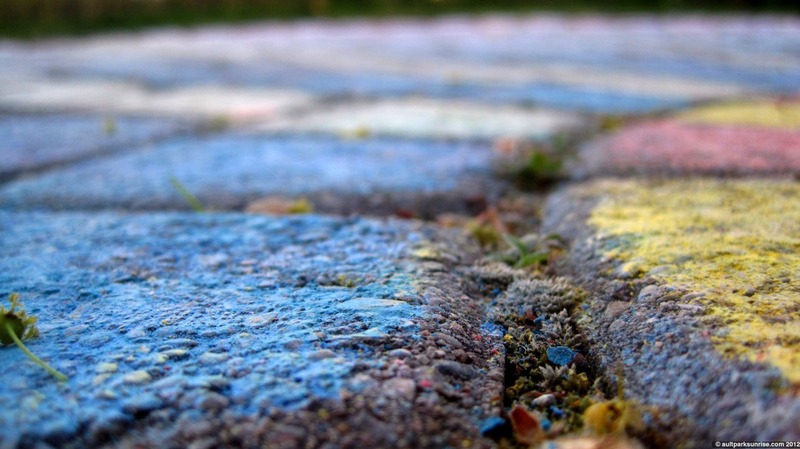 Macro Chalk. Even the moss between the stones got a color bath. With no rain being forecast for this week, perhaps this temporary art piece will last through this weekend. 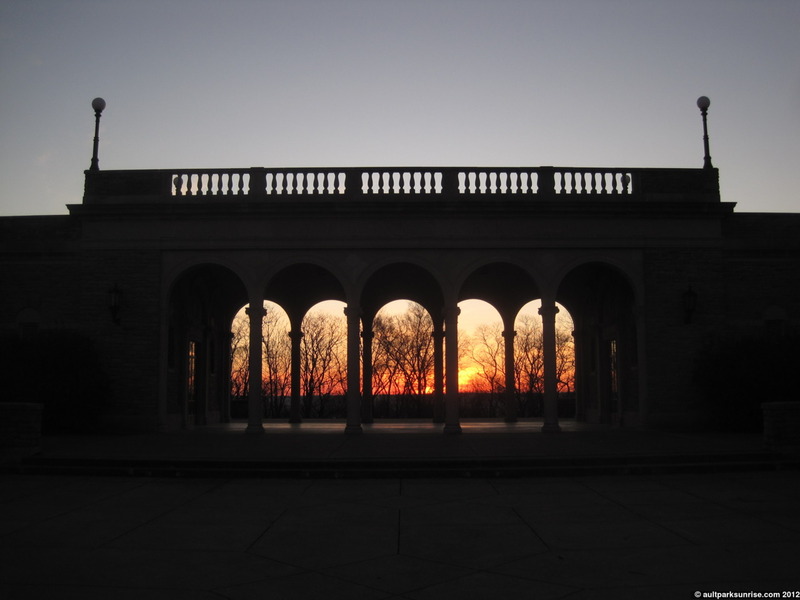 It’s hard to believe, but Ault Park Sunrise is one year old! This past year has taught me so much in so many areas. I’ve gained a new appreciation of my local community and the larger city as a whole. It’s also been the first year where I have watched the seasons pass with careful diligence and focus, something that can easily slip by as we focus on our day to day lives. I’m only one sunrise away from 160, which would have made for a great coincidental time stamp but that will have to wait until later in the week. I also have a small queue built up of interesting posts, including an essay from a guest writer, some beautiful pictures of the Ault Park’s blooms from a friend (which have now faded into memory), and some historical pictures of a local estate sent to me by a fellow Cincinnatian that sheds some light onto the history of one of the large estates in the area. Also coming up is Sunrise 158, which one may notice is missing from the front page. I’ve been working on it for the last week but unfortunately I haven’t finished it. Rather than continue not doing morning rides while it’s in the hopper (I don’t like posts falling behind lest they never get published), I decided to just put it on the “draft” list and get on with Sunrise 159. 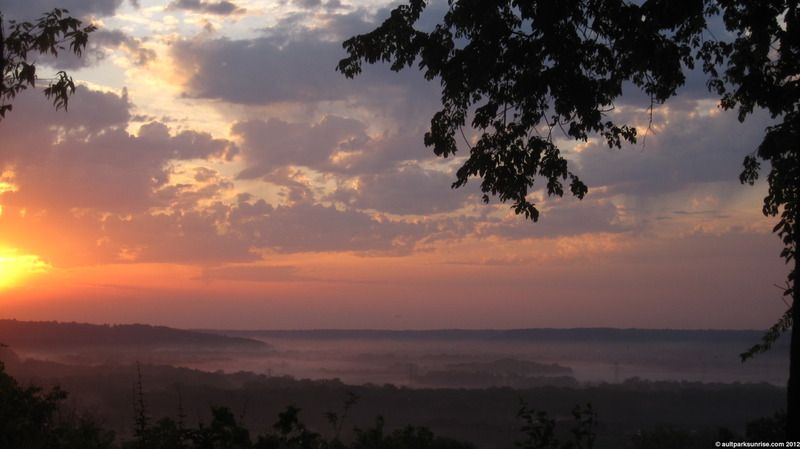 I woke up this morning after a long holiday weekend (following a long work week) with a yearning for a sunrise ride. The ride was brisk and I actually had to turn around after my initial departure to get a sweatshirt. I stopped by UDF for a coffee (freefil Monday) and was on my way. The sky was crisp and clear to the east, but there was a slow moving cloud front moving in from the west. As the sunrise arrival came near, the cloud bank continued to slip further into the eastern twilight sky, making for an interesting sky dynamic that was changing through the colorful early morning show. The sunrise itself was a nice deep orange with a few pink highlights that briefly dashed across the impending cloud bank. The most surprising thing to me is just how quickly spring has arrived. 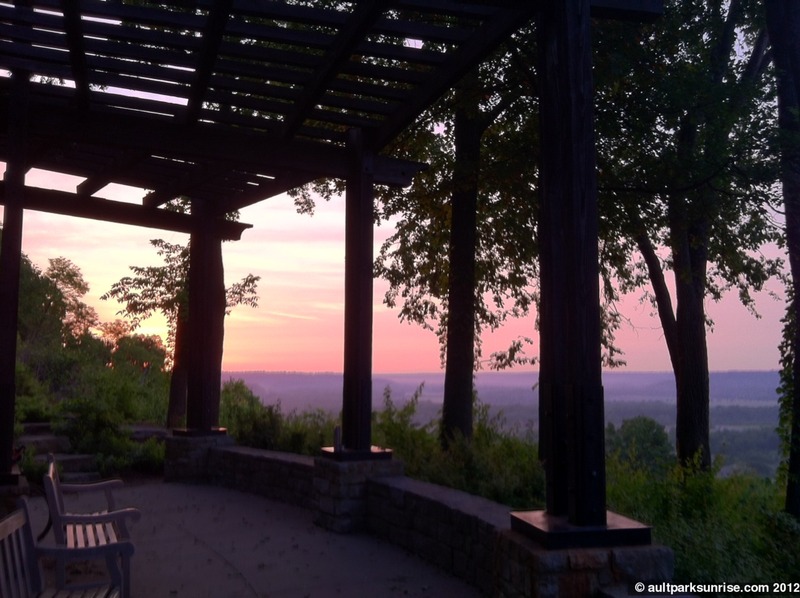 It’s been just over two weeks since I visited Ault Park (Alms Park was my most recent visit before we left for Charleston), and yet the overlook is lush with foliage and the trees are well on their way to having a full spring coat of greenery. I’m also pretty excited about the sunrise time that continues to push earlier into the morning. 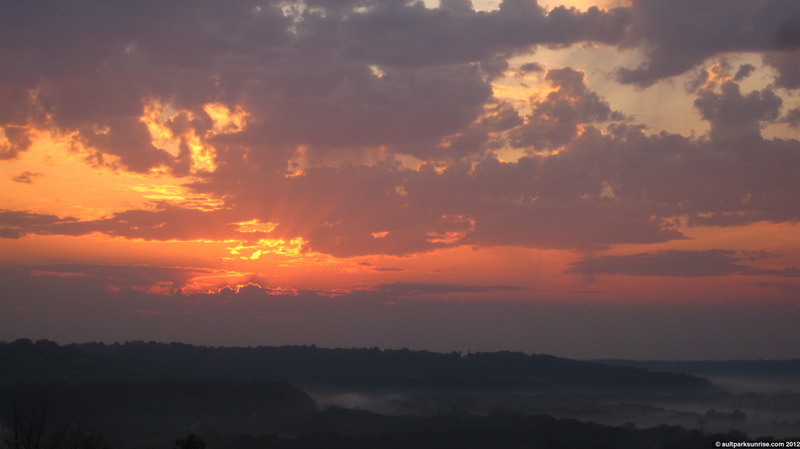 Sunrise 159 clocked in at 7:09am and it will only get earlier as we march into summer. One of the best parts about exploring a city park after a weekend, and in particular a holiday weekend with great weather, is finding the leftover markers of human activity. 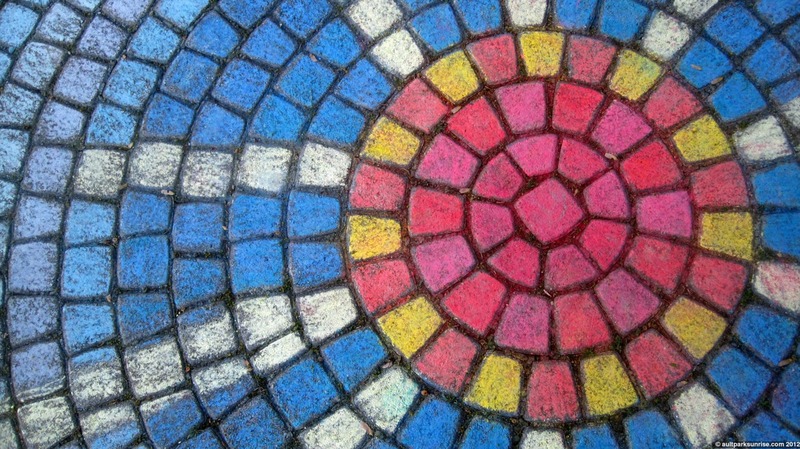 Sometimes there is trash, but more often than not there is something else: sidewalk chalk art! This morning I found plenty to entertain along the main walkway that runs along the center lawn in front of the pavilion. I was amused by the video game inspired “MarioKart” starting line. It was even complete with a set of “?” boxes 60 yards up the sidewalk, whose purpose is to give the player that runs over them an item like a green shell, banana peel, or even star power. Behind the Mariokart tribute there was another piece of artwork that appears to have been left by an artist with a bit more patience and a steady hand. I found myself quite moved by the artwork, especially after I considered that the subject of the work appears to be a sun with its rays bursting out from the center of the tile into a blue sky. The artist (or artists) carefully colored each individual brick in the sidewalk and were even symmetrically mindful. 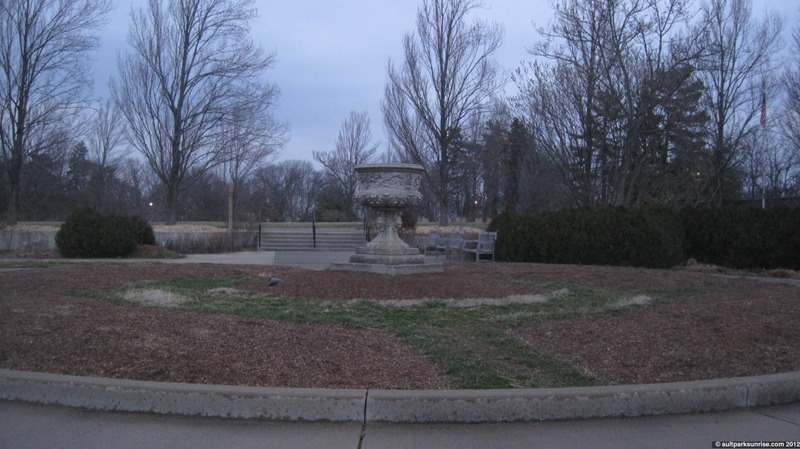 I find it so interesting that this artwork has appeared on the morning of Ault Park Sunrise’s one year anniversary. I’ll just try to not think too hard about it :). 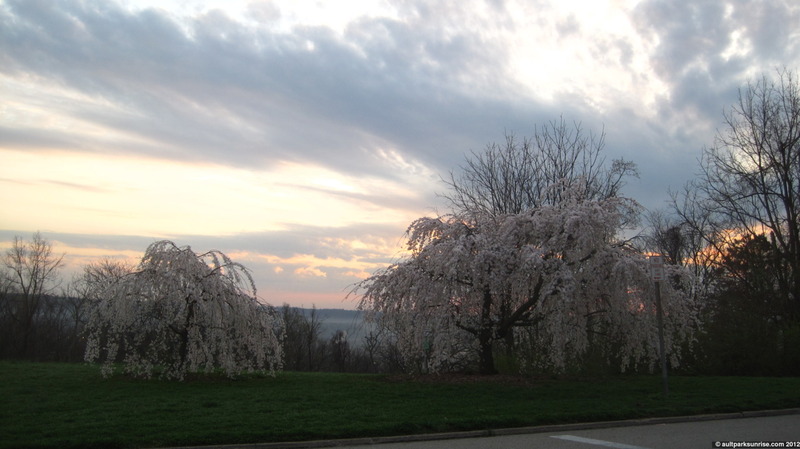 I arrived at the park just as the twilight backdrop was coming into full bloom. The twilight sky was just beginning to take on an orange gradient as the east-moving overhead cloud bank threatened to block out the sunrise. Has it just been two weeks since I last saw this Tree of Heaven? She was the subject of many winter photos, and already she has a healthy coat of green growth. Until next winter, old friend. Just before sunrise there was this vertical column of pink that shot up through the sky. Here you can kind of see it to the middle/left of the picture. 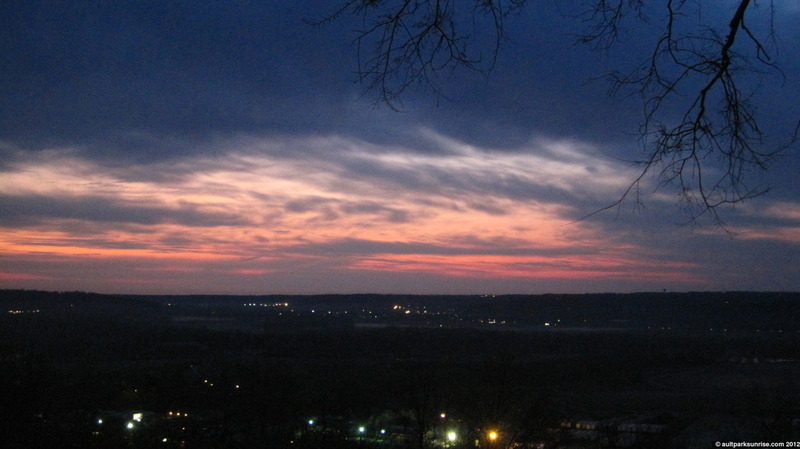 The late sunrise colors turned into a slurry of pinks and purples, kind of like an Easter palette. Happy first day of Spring! And also, it’s official. 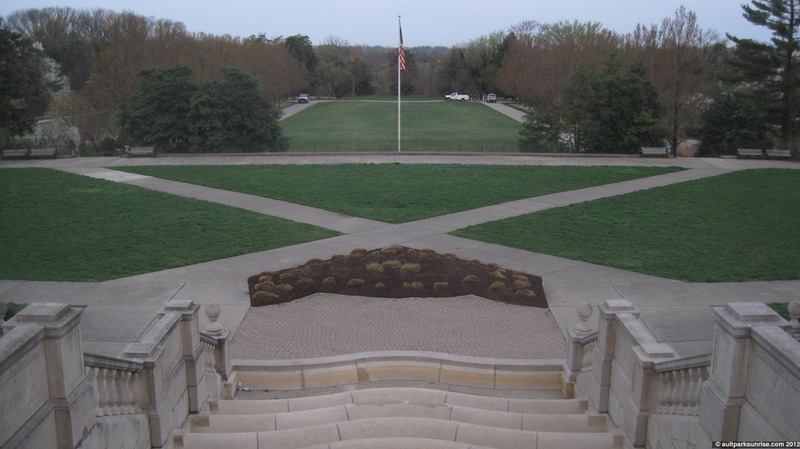 Ault Park (through the symmetrical axis about the pavilion) can be considered to be aligned with the first day of spring. 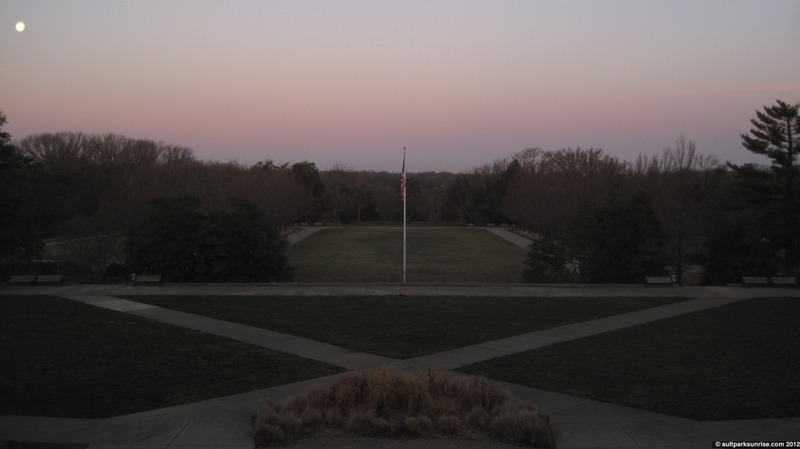 More specifically, it is aligned with the location of the sun about 10 minutes after sunrise on the first day of spring, allowing for a beautiful view down the hill and across the lawn. I was hoping to make this morning a nice quick trip up to the park. 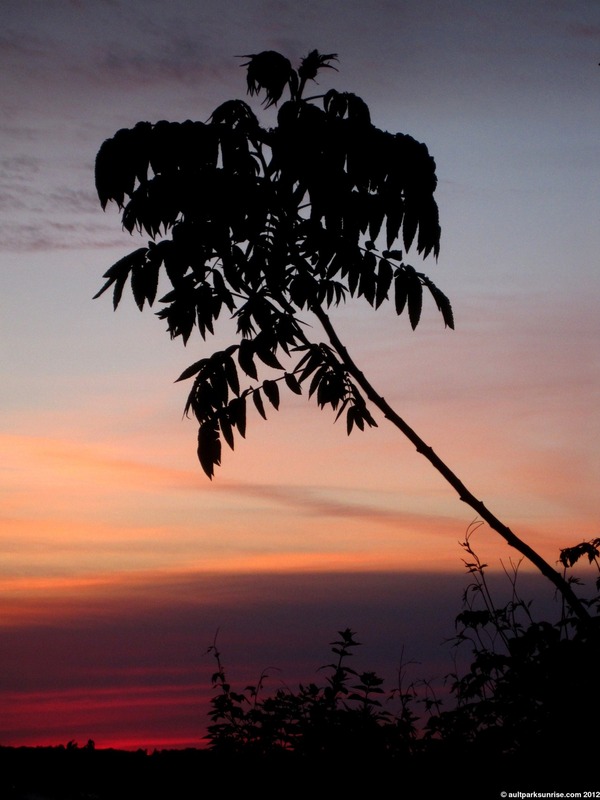 The sunrise was calm and quiet in an atmosphere that had a soft mixture of colors. It wasn’t until the actual sunrise, however, that the sky started to light up and the clouds danced in an illuminated atmosphere. As I mentioned yesterday, I had hoped to make it up to the park this morning to check in on the pavilion’s alignment with the sun. I must say that at first I was quite surprised, and frankly a bit confused. 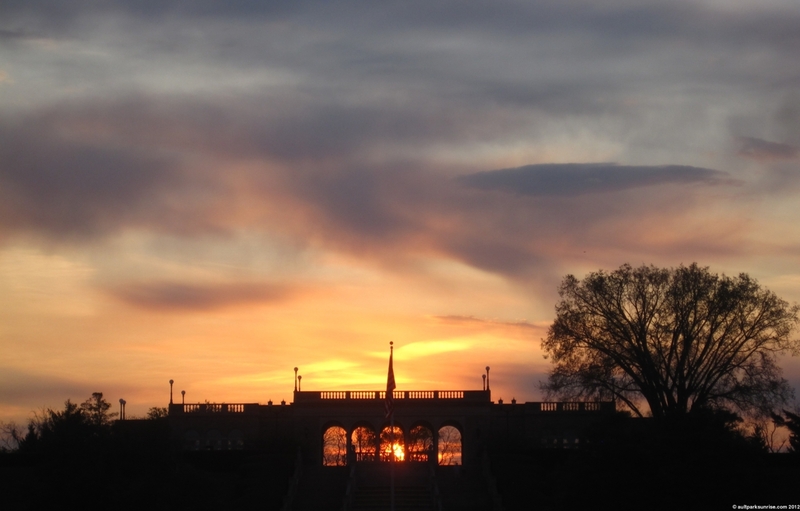 You see, yesterday I believed that the sun had risen to the right of the center of the pavilion. Well, today it rose to the left of the center of the pavilion. At first I thought that maybe I had it all wrong – that the pavilion was not actually aligned to the first day of spring. Well, as it turns out I was thrown off by the fact that the sun does not rise straight up into the sky. 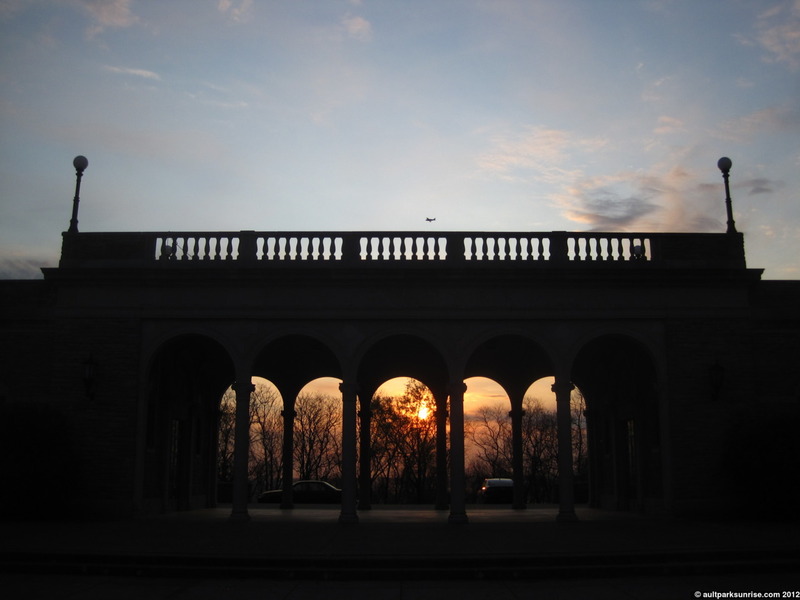 The sun actually rose in a diagonal, placing it front and center between the center two pavilion columns by about 10 minutes after sunrise. Once I figured this out I was much more relieved. 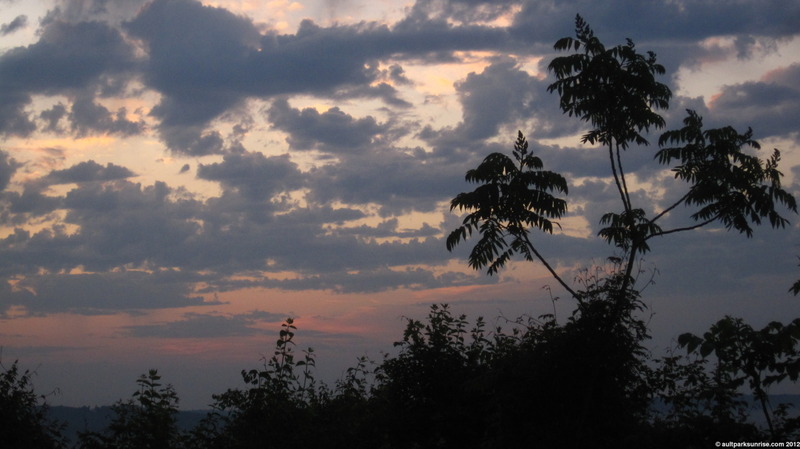 It took me 156 sunrises to figure out that the sun doesn’t rise straight up – something that makes sense when you think about it but never encroached into my frontal consciousness. I got lucky with some beautiful shots of the pavilion from across the lawn. With the sun’s intense rays making my camera use a high aperture, the effect is always a pleasant one – silhouettes and dynamic clouds. 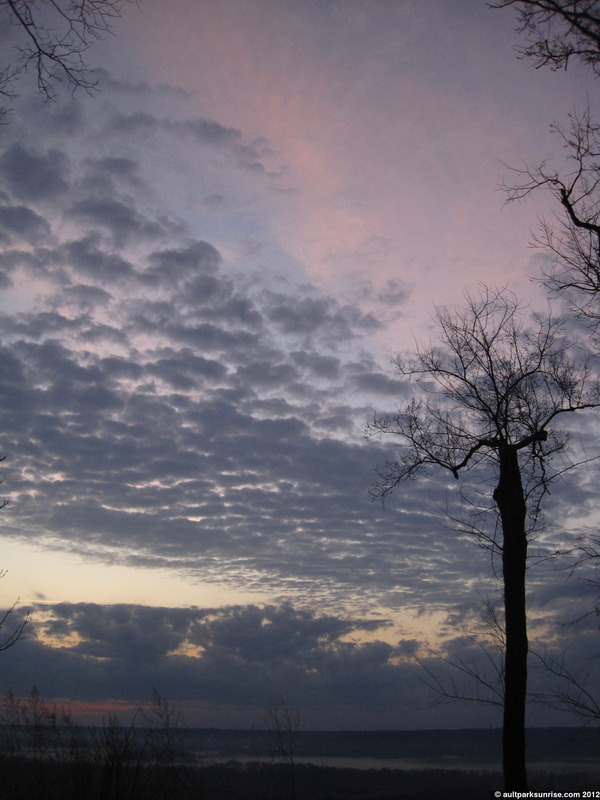 The early twilight sky. Dark, calm, and quiet… well quiet if you don’t count the ridiculously loud orchestra of bird activity. From the pavilion the lawn had lit up nicely. We can see the park crew out and about on this fine first day of spring. 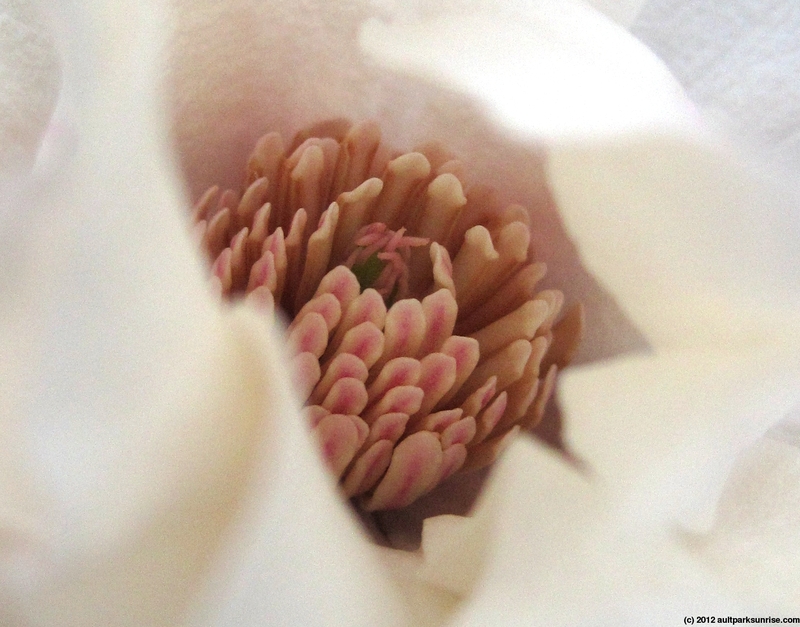 Believe it or not, this is a GREEN magnolia blossom. I’ve never heard of such a thing! 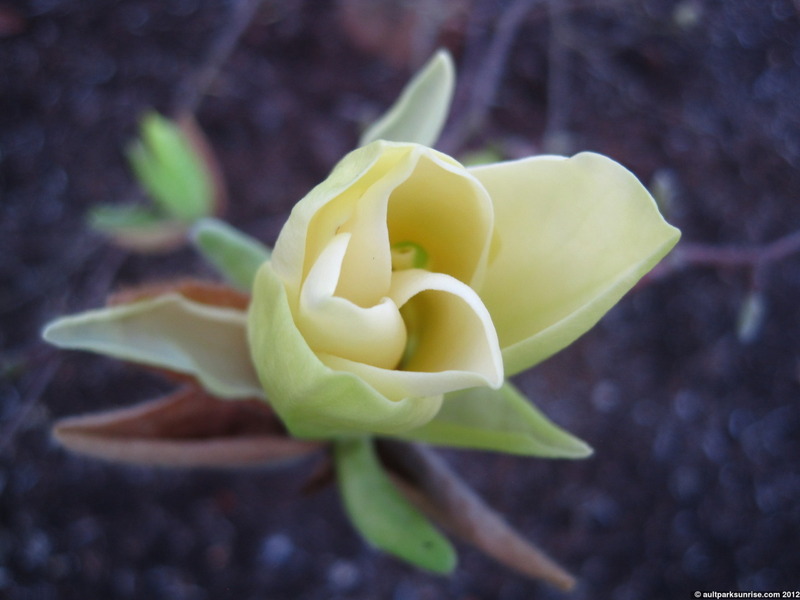 I may be mistaken, however, because I can’t find many references to a “green” magnolia on the internet. I’ll check back in at a later date to confirm. 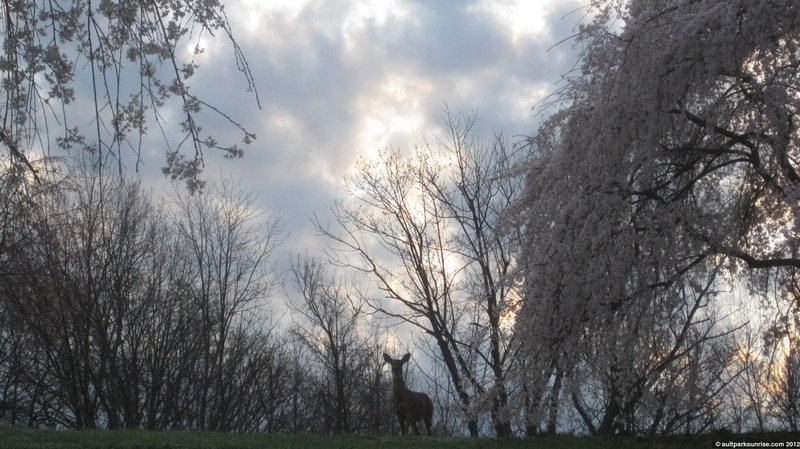 In the weeping cherry grove off of Observatory Rd, a curious young female doe ponders my neon green t-shirt. I’ll admit, I was pretty darned excited about the sunrise this morning. 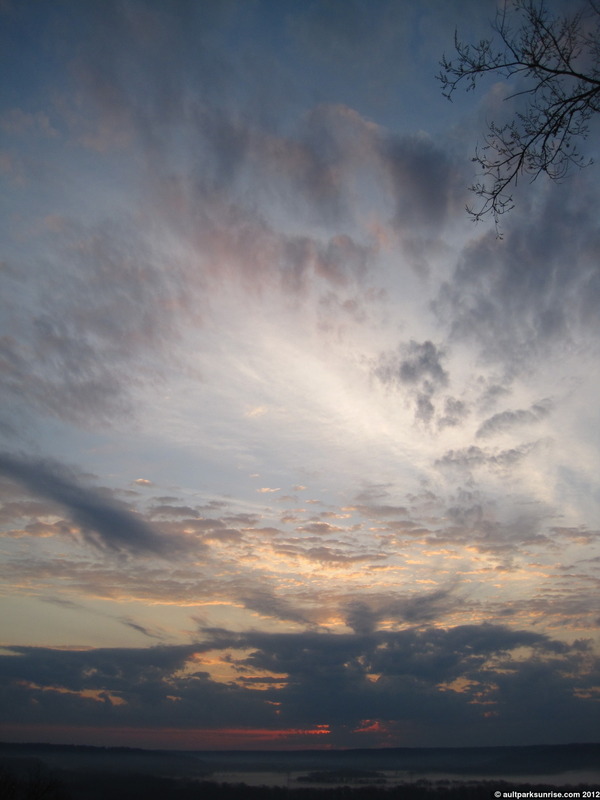 The atmosphere had a rich mix of cloud species with an open atmosphere behind it. It had all the pieces needed for a truly unique and majestic sunrise. In the end, it was a pretty neat sunrise but none of the early magentas, pinks, and purples made a very strong appearance. 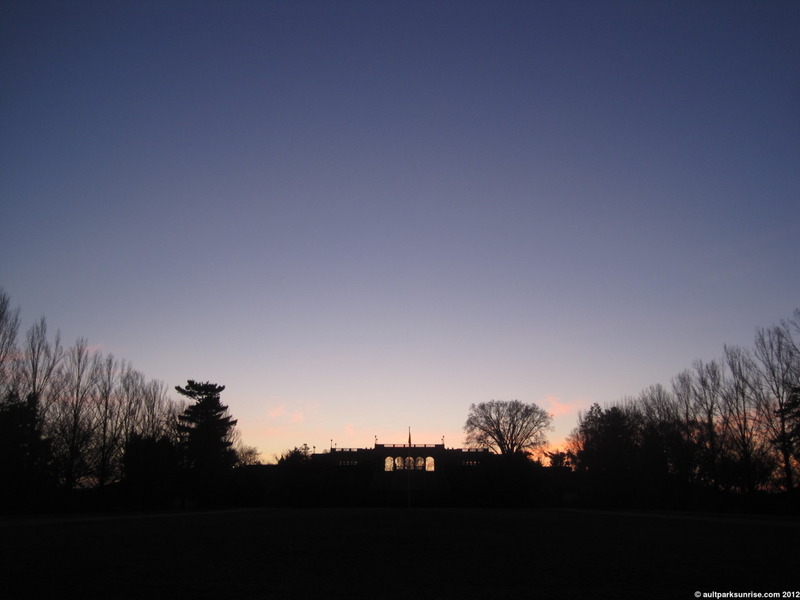 There was a thick low lying cloud bank that blocked most of the early rays of light before they could penetrate into the upper atmosphere above Ault Park. 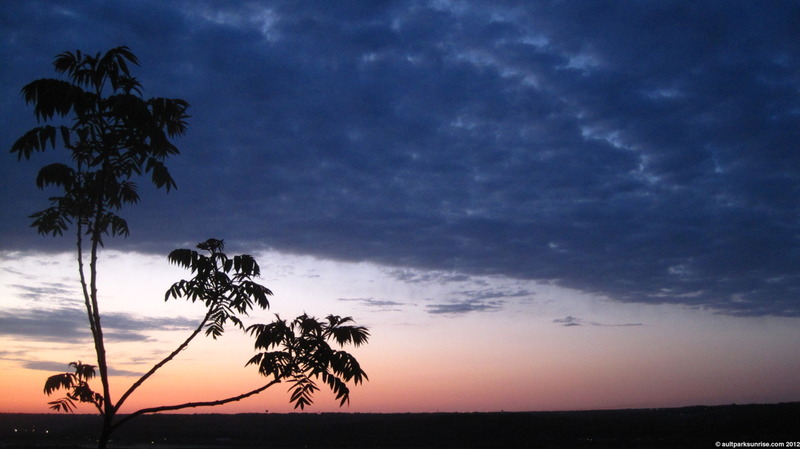 Now that I know the secret behind Twilight Sunrises, however, I’m really looking forward to this spring. I mean just look at all these clouds! 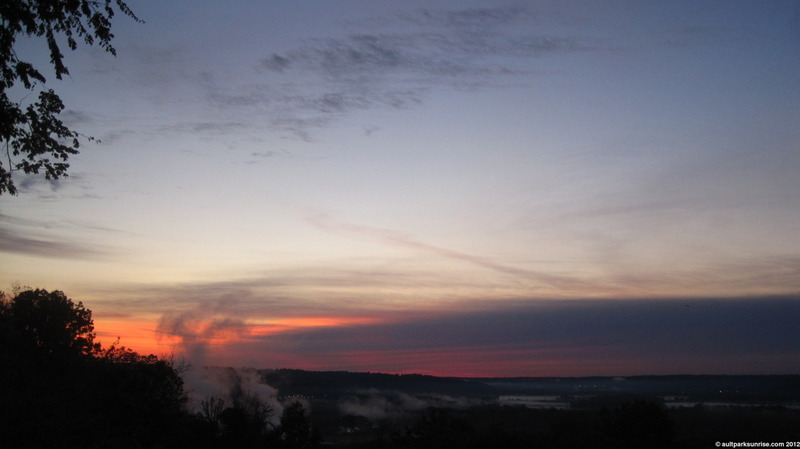 As I arrived in the park, about a half hour before sunrise, the lower horizon was showing a deep red color. 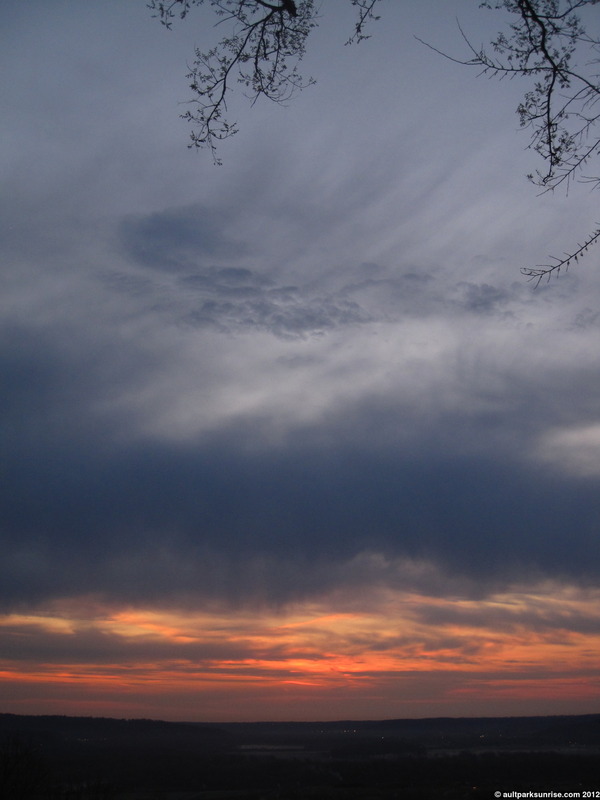 I was hoping it would fade into the upper atmosphere, but alas it remained confined to the lower horizon. It did make for an interesting show, however. The sky stayed mostly the same for about half an hour until the backdrop suddenly lit up in a teal blue color as the sun rose behind the clouds. The upper atmosphere made for a nice bright backdrop to the lower layers of clouds. In the distance, we see a forest island in the midst of a river-of-fog. That’s not water, it’s fog! 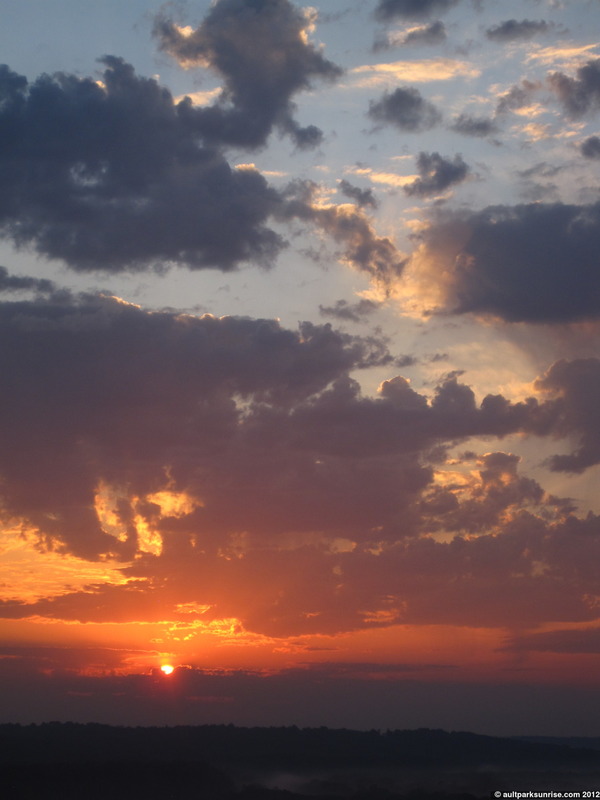 Lots of cloud action in the sky this morning… such a perfect opportunity for a breathtaking sunrise. 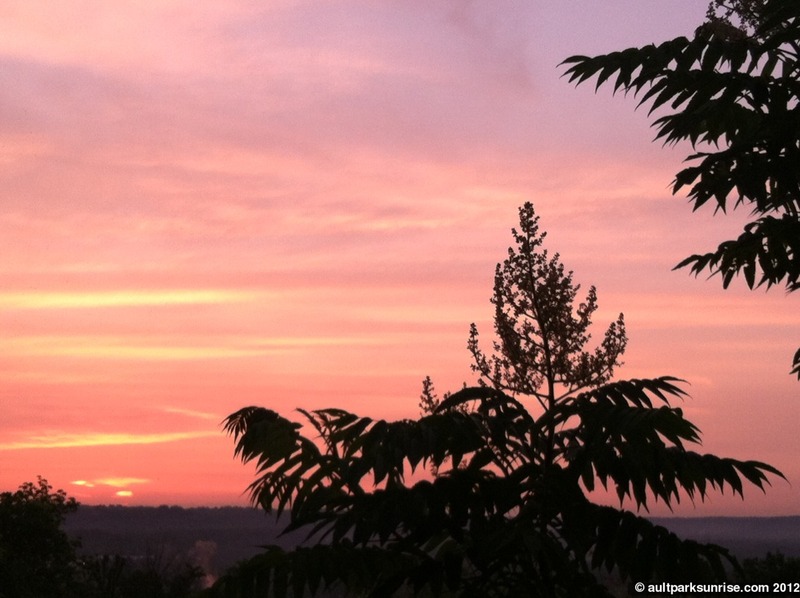 The stars did not align but it makes that rare magenta sunrise that much more beautiful. Still… I can’t really complain. This morning’s sunrise was beautiful in its own right. 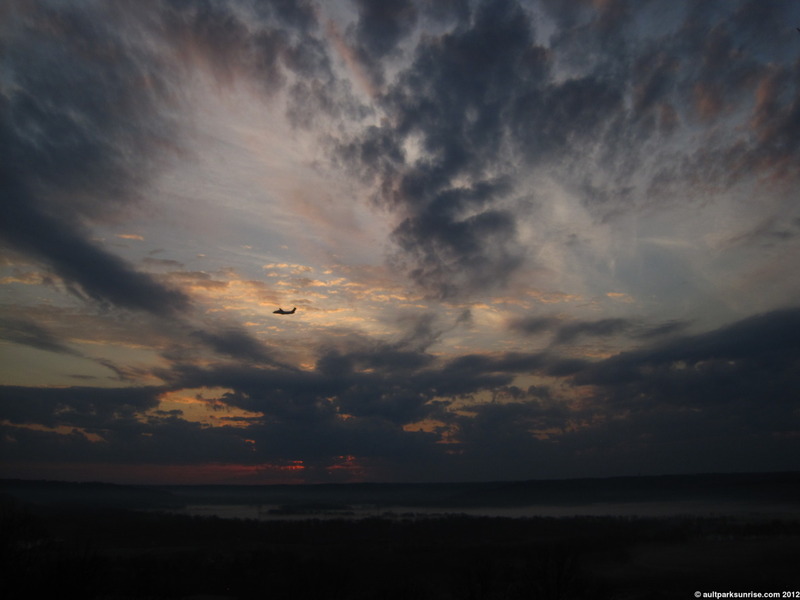 A plane takes off against the dramatic sunrise sky. 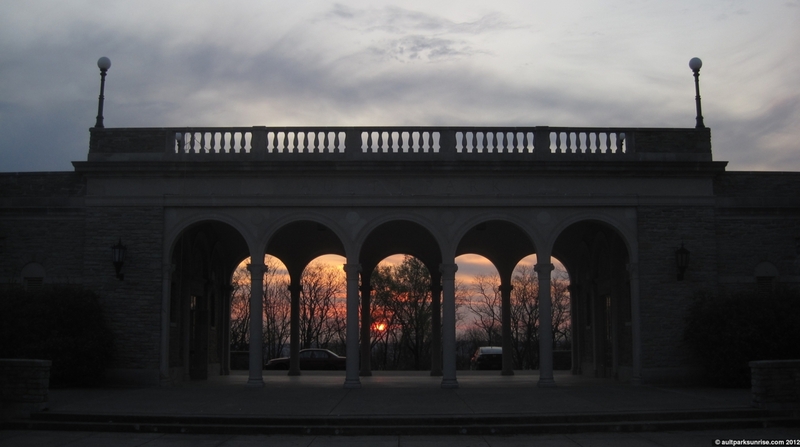 After the sunrise, I swung by the pavilion to check on the sun’s location relative to the alignment of the building. 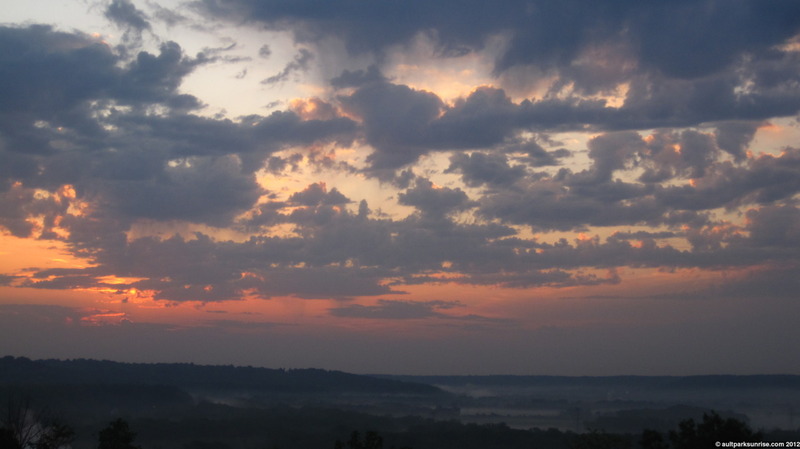 I was afraid that maybe I’d missed the “perfectly aligned sunrise” sometime this weekend. I was relieved to find that the sunrise isn’t *quite* aligned, yet. It still has one or maybe two days to go… which means that my theory may prove to be true after all! 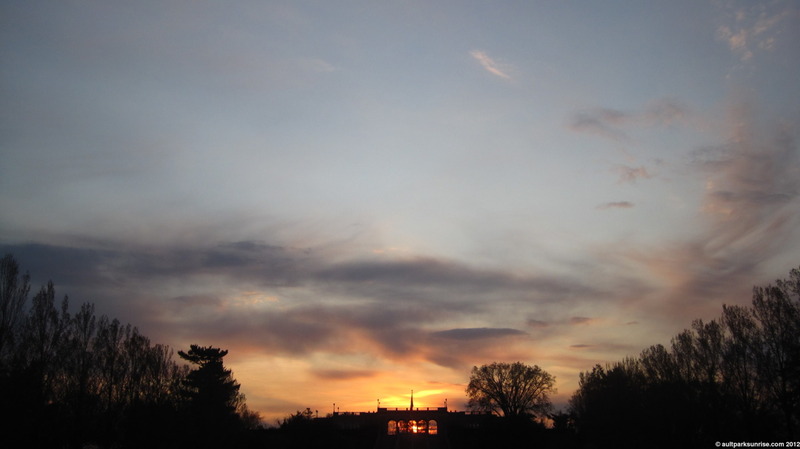 I’ve been following the path of the sunrise relative to the pavilion for several weeks now. You see, the entire park is symmetrical with the garden layouts and walkways. The entire symmetrical axis aligns itself relative to this pavilion… so it goes to show that if the pavilion itself is aligned to some celestial event, that makes the entire park aligned as well! 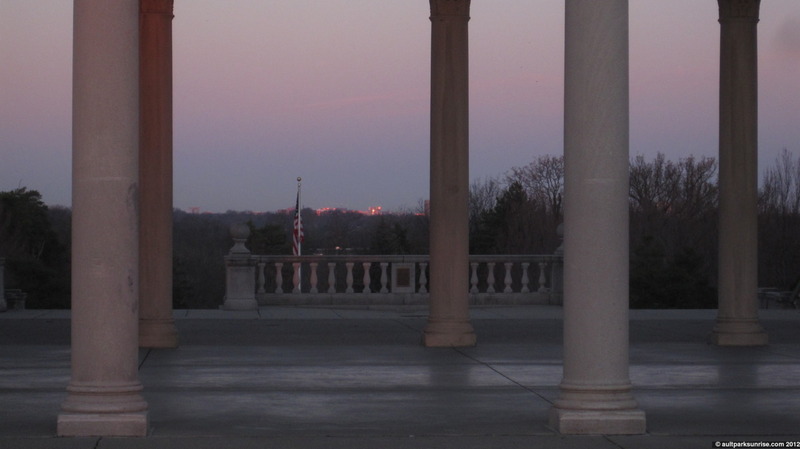 So it goes to follow that at some point in the next two days the sun will rise up squarely in the middle of the Ault Park Pavilion’s columns. What event is occuring in the next two days that would warrant such a dramatic design decision, you may ask? Well that answer appears to be the first day of spring! It makes perfect sense… I mean just looking around the park this morning it was obvious that the gardens and the park itself is absolutely exploding in the trappings of spring. I would like to think that it is no mistake that over half of the trees in the gardens appear to be healthy mix of the blooming variety. Pears, cherries, magnolias, and I’m sure many others. 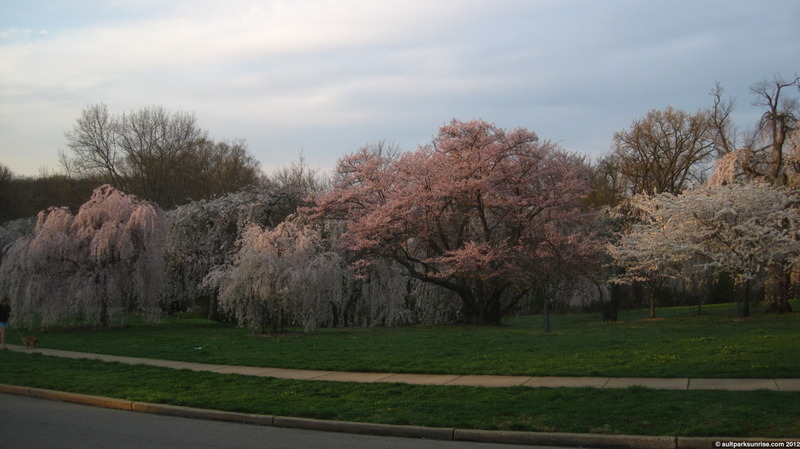 Could it be, then, that Ault Park is actually a living tribute to the miracle of spring? Suddenly the evidence is all around me. The pavilion alignment with its symmetrical park design, the several groves of weeping cherry trees along Observatory park, the myriad of blooming trees scattered throughout the garden and the handful of magnolia trees… not to mention the brand new cherry grove that was planted to mark the 100 year anniversary of the park. It makes me happy to the core to find out that it is very likely that the pavilion, and hence the entire park, is aligned with the sunrise of the first day of spring. I believe that the ancient woodland (& others) mound building cultures (Hopewell, Ft. Ancient & Woodland) that lived in this valley for hundreds, if not thousands, of years would find comfort in knowing that we haven’t completely lost our bearings relative to our relationship with the celestial wonders. I’ll be sure to make it of the utmost priority to get to the park for the next few sunrises to verify that my theory is correct. Stay tuned! I showed up *extra* early, taking advantage of the post-Day Light Savings sunrise… only to spend the morning in the dark. I’m as surprised as you are that I got this good of a shot in the dim morning light. Good morning! 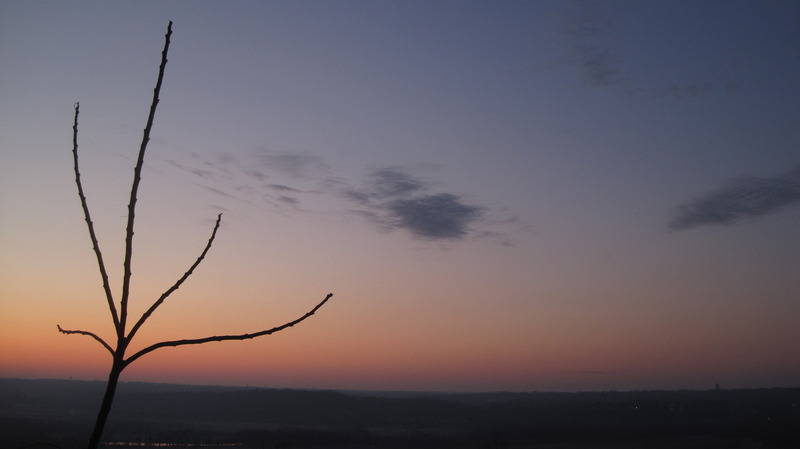 I ventured out for the first post-DST sunrise at 7:50am this morning. I took advantage of the late sunrise by getting up extra early and setting out for the park by 7:10am. I looked up into the sky and saw a thin cloud layer with patches of blue which meant that it was definitely worth a gamble. I’ve been getting a bit bored by the clear morning sunrises and have been hoping for a change up, especially with the upcoming spring weather. There was a chance that this morning’s thin cloud layer could provide an amazing reflective backdrop of pinks and oranges, but alas the clouds ended up being too thick for the sun to penetrate. I did, however, take full advantage of the amazing weather this morning. A light rain came through the area last night so the pavement was wet and smelled like earthworms and petrichor (a word I learned last year and try to use as often as possible). The air was thick with humidity and as I dove into the park via the steep hill on Observatory Ave, I could feel the temperature suddenly drop. 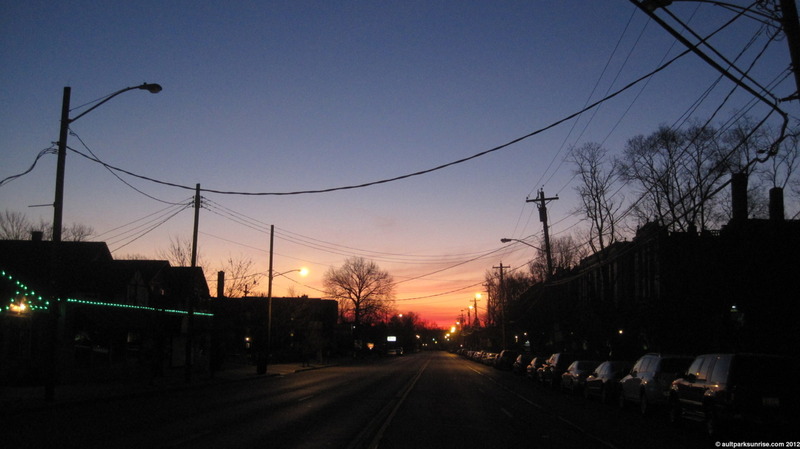 The cool air rolling across the quiet dark street from the budding forest was refreshing and spirit lifting. 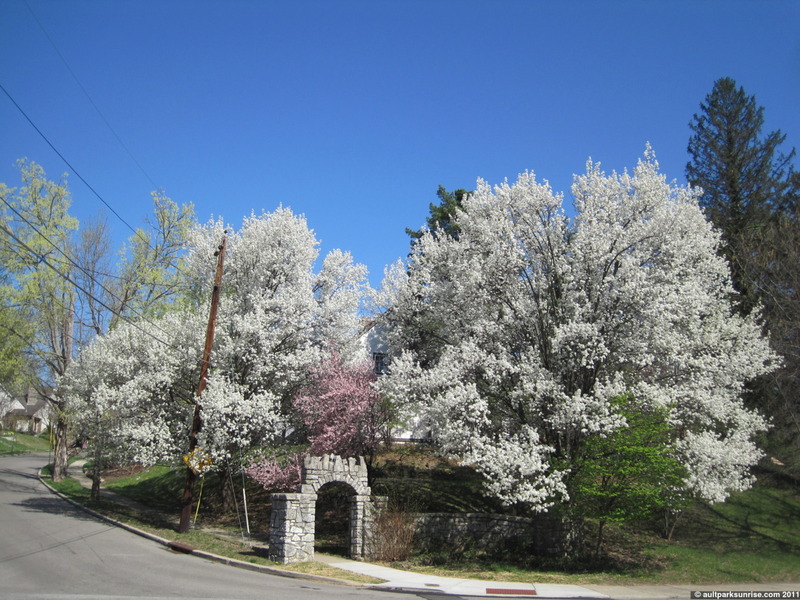 And another picture from April 2011 featuring some bradford pears off of Erie Ave. 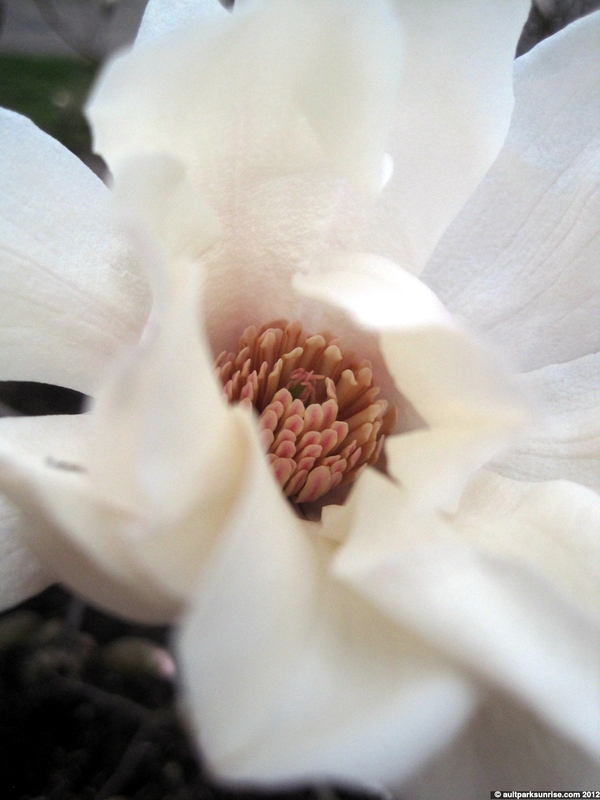 The magnolias have started to bloom… the bradford pears are next! 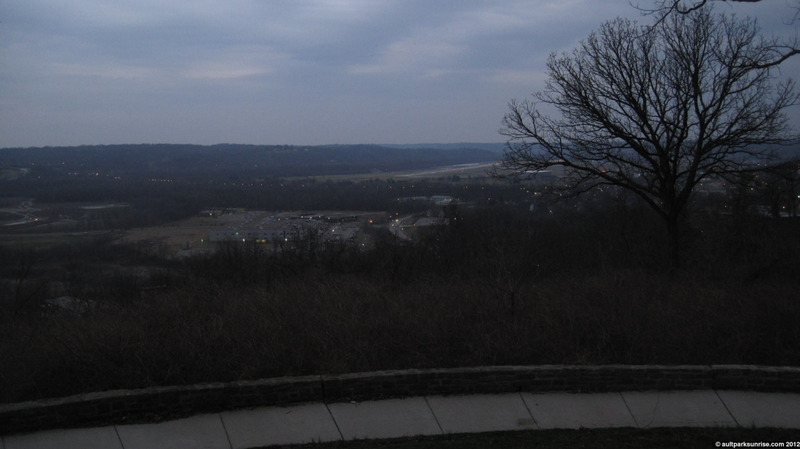 Late twilight above the Little Miami River Valley, a day before Day Light Savings ends. 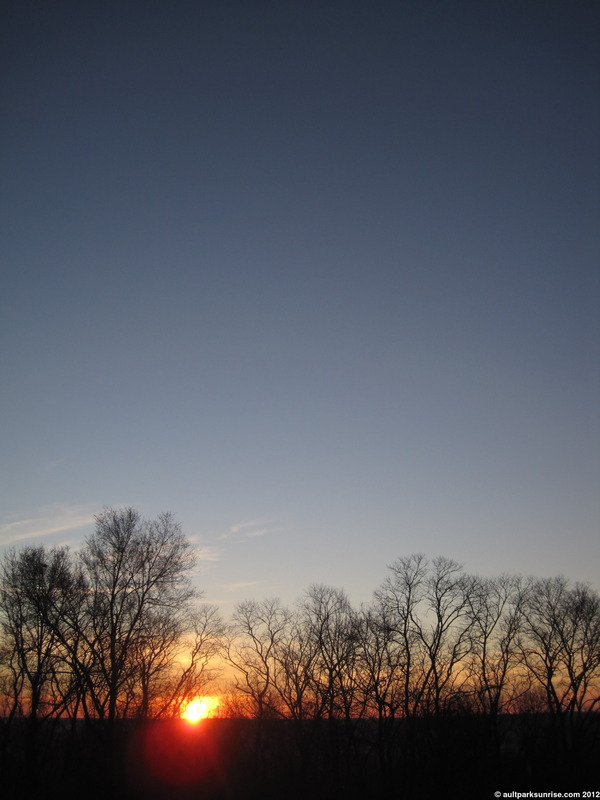 I woke up to another crisp, cold, & clear winter sky for Sunrise 152. I was up a bit late last night and so I chose to perform a recent ritual that I learned about, one that apparently native americans used to practice. Namely, drinking a full pint (or more) of water just before going to bed. That may sound like a recipe for disaster but luckily I don’t have a history of bladder control issues ;). It worked – I was up this morning and out the door by 6:30am. It was really cold this morning. Normally this would be expected due to the fact that it’s still winter, but our recent warm streak has made me spoiled. I wore an off kilter hybrid of spring and winter gear – running shorts and thick gloves, with no face mask. 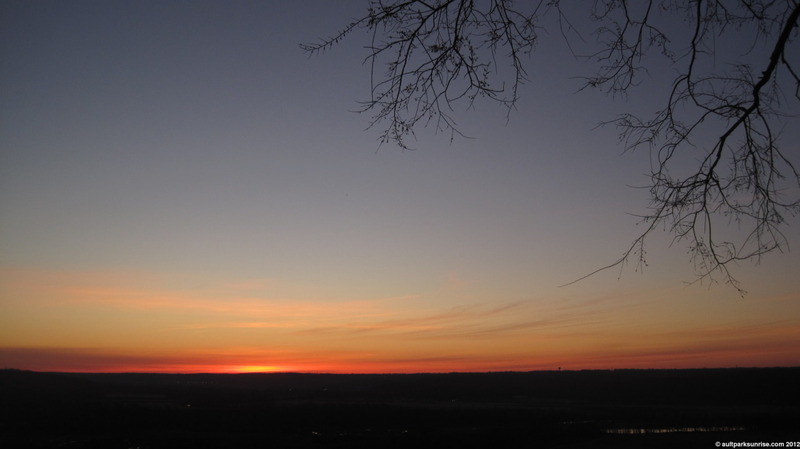 It wasn’t too bad during the 22F twilight ride, except for the dive down the Observatory Rd hill that felt like dipping my face in an ice bath. The cold certainly woke me up, however… I didn’t grab any coffee and practically sprinted back up that hill. 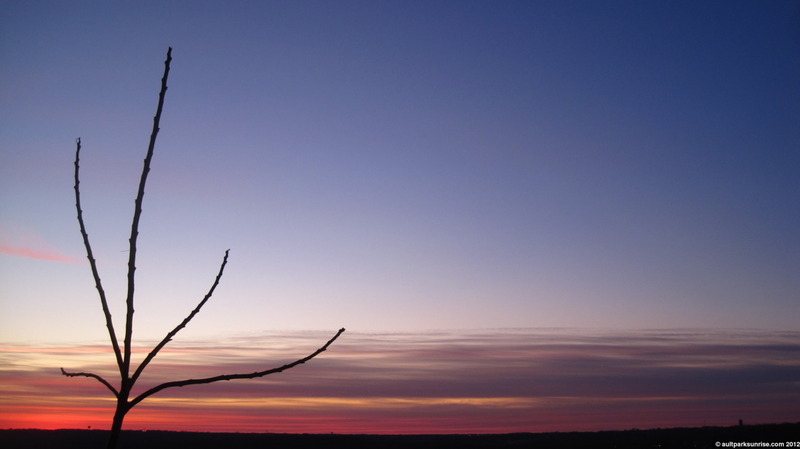 Unfortunately DST starts tomorrow which means we’re back to 8:00am sunrises. Darn! 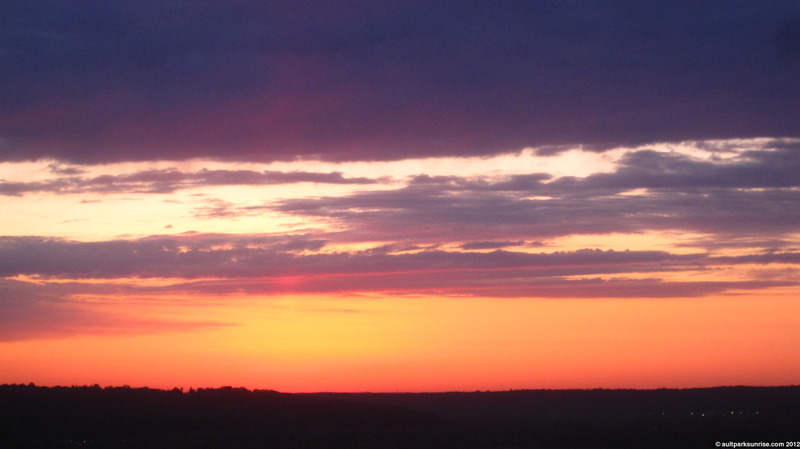 This morning’s sunrise had a nice magenta display that I witnessed on the ride up to the park. By the time I arrived the pink had mostly faded, unfortunately, and was replaced with a soft orange palette. Still not much cloud action in the air, a trend I hope to see pick up as we move into the dynamic weather of spring. 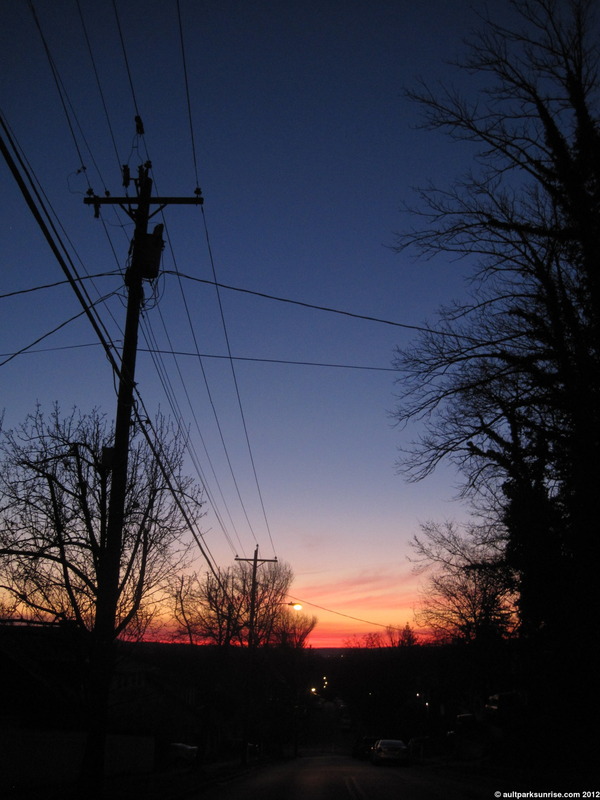 After climbing one of the residential hills, I looked behind me and saw a beautiful magenta horizon. The colors were quickly beginning to fade. As I approached the park I decided to get a picture from the same perspective as a picture I took during the most recent overcast Sunrise 151. Isn’t it interesting how much the picture changes when you add a backlight? The following picture was taken earlier in the morning but under an overcast sky. The beautiful century tree next to the pavilion. 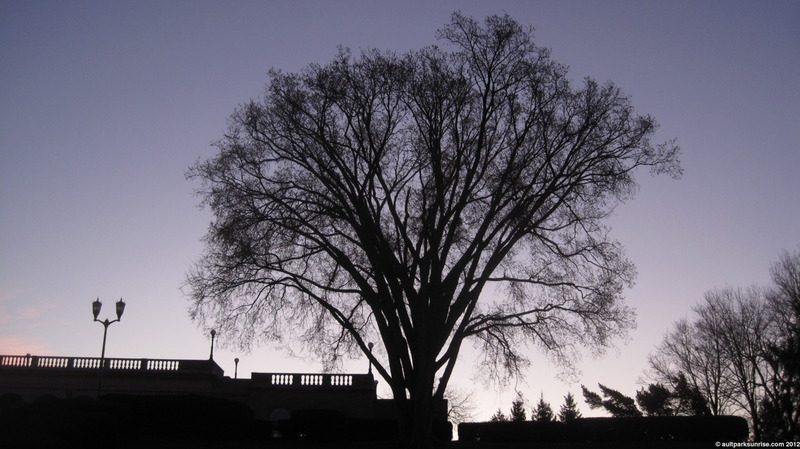 I often wonder if this tree had a symmetrical brother on the left side of the pavilion. Given the symmetry of the park’s design my gut tells me yes. What a sad loss for the park it must have been when this hypothetical tree died. Ten minutes before sunrise, we can already see the light aurora forming in the Eastern Sky. I wanted a vertical shot but didn’t want just an empty sky… this was the compromise. Back at the pavilion I check the sunrise alignment. Approaching the center of the pavilion, but we still have a week or so before true alignment. I hope I don’t miss it! In the Western Sky the almost-full-moon reflects back the morning sunlight. As first light approached, I noticed the residential towers on the far western ridge line. You can’t quite see it in this picture, but the top row of windows were reflecting the tip of the sun that was just beginning to peak across the horizon. The roof of the pavilion was closed for maintenance so I had to make due at the base of the building. First Light @ Sunrise 152! It may look barren, but this garden is packed full of flowering cosmos and other prairie flowers. The center stone pot will be all but covered by July. 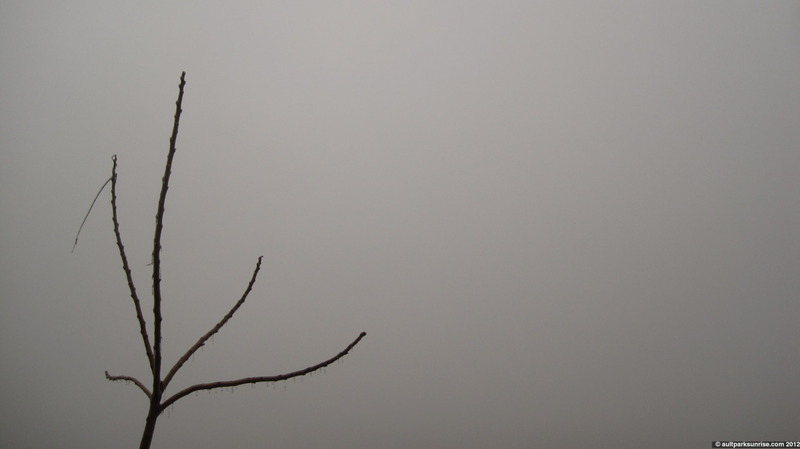 I woke up this morning and peered out the window to see a dark gray/blue overcast sky. The warm weather had me excited so I decided to take my chances and see if there was going to be a sunrise this morning after all. I was hoping that maybe the light cloud layer that rolled in late last night was still around, but as it turned out the sky was filled with thick gray rain-filled clouds. I left for the park with a light drizzle lapping the pavement around me. This morning the weather was so warm that I actually wore shorts and a sweatshirt – no hat, gloves, long pants, double socks, or facemask! In fact I’d say that this morning’s sunrise ride was one of the most pleasant trips up to the park if for no other reason than I was able to truly appreciate the ambient sounds with more novelty since I was not wearing my winter facemask. 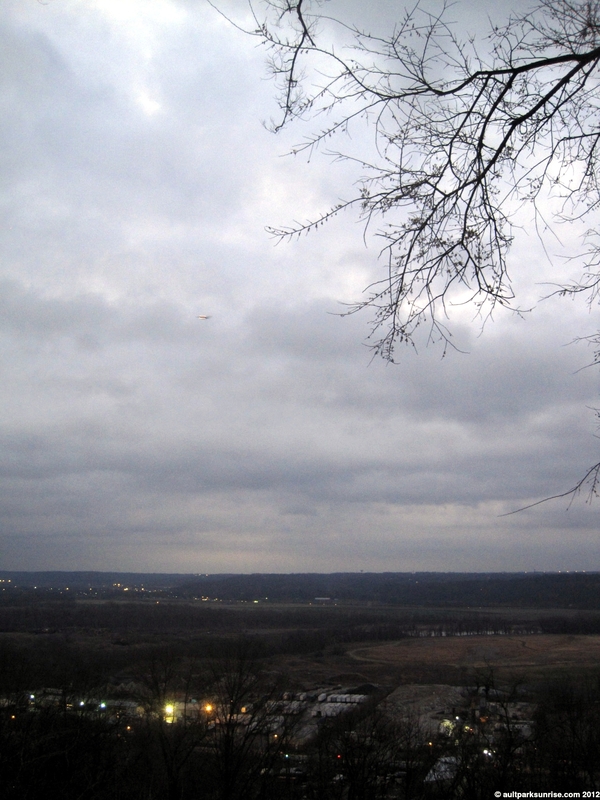 The wet atmosphere held a steady 52F as I worked my way up to the overlook in Ault Park. The air was sweet and smelled like spring. 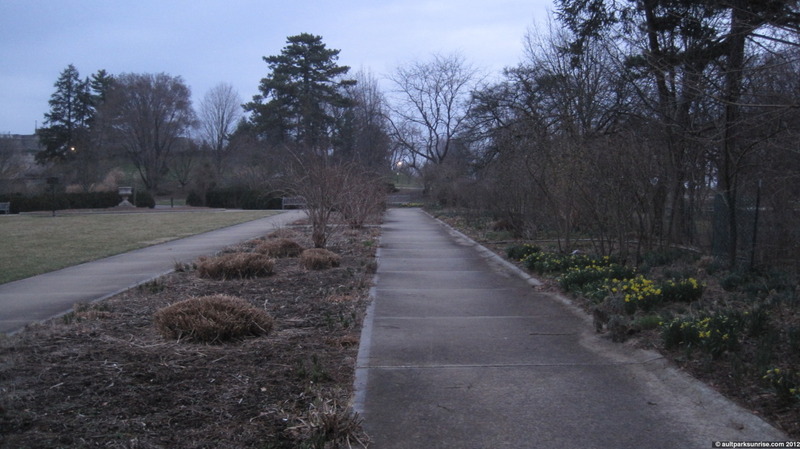 With no sunrise in sight, I casually strolled through the gardens and took some pictures of the desolate ground that has already started to show signs of life. 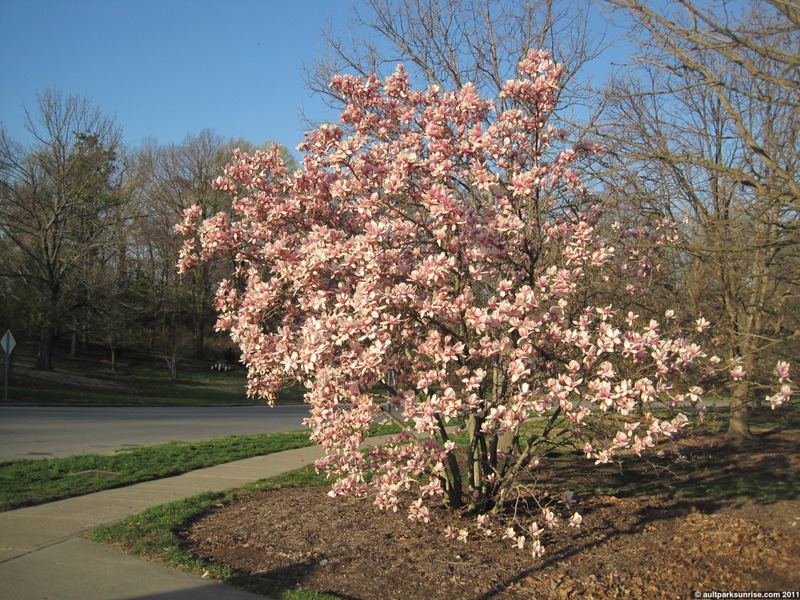 There are several pieces of the gardens that look barren right now, but in just two short months they will be exploding with garden life as the plants take advantage of the warm humid sub-tropic microclimate of Eastern Cincinnati. The birds were loud and flirty this morning in the warm air. No doubt they too detect the first comings of spring. 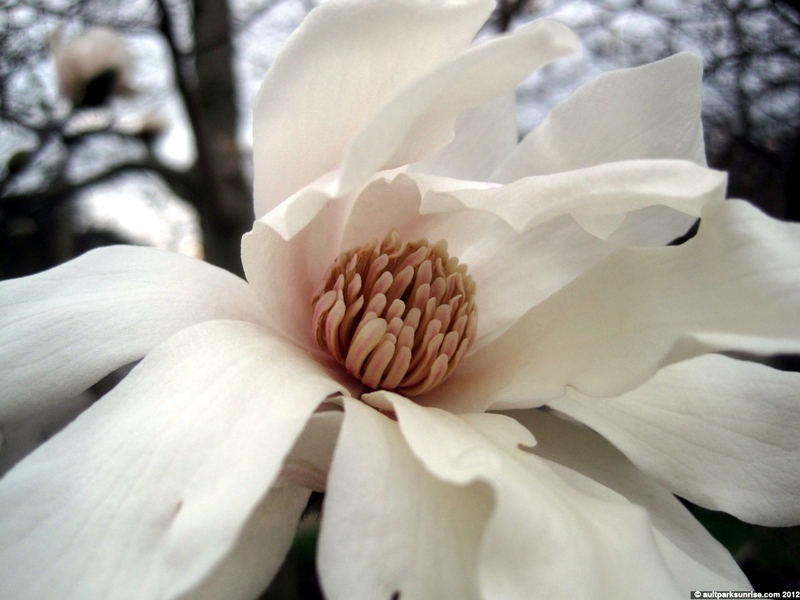 I found buds in the trees, especially the magnolias. Their buds are already the size of my thumb and will be bursting open in white and purple blooms in just 6 short weeks. Mentally I’m still prepared for winter, but in the back of my mind I know that spring is almost here. With spring comes green life, organic growth, colorful blossoms, and so many insects to find. I’m looking forward to Armleder Parks prairie and the 10′ high stalks of meadow grass & compass flowers. 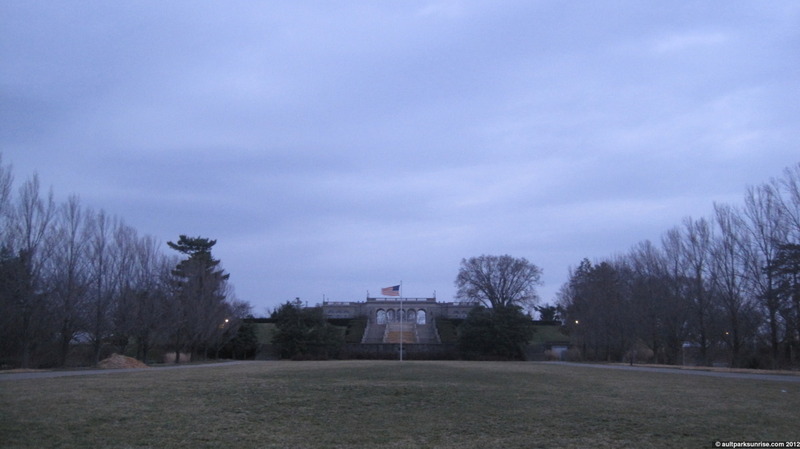 Rolling into the park I find the central yard quiet and calm under a blue layer of twilight clouds. Just think about how lush this walkway will be in just 8 weeks. The daffodils have broken ground and are already starting to bloom. Here’s another shot of a spot where I know the plant life grows thick. In the heat of the summer this garden explodes with several generations of daffodils & flowering bushes. 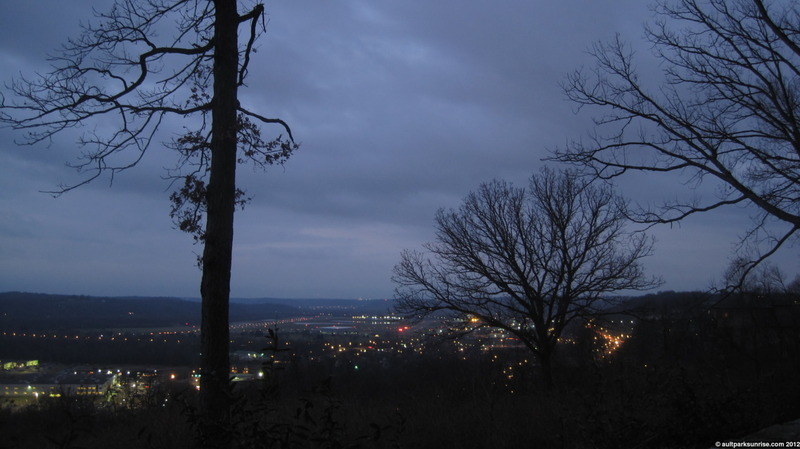 A calm and blue/gray Heekin Overlook as the storm front rolls in from the west. Looking South/West across Lunken Airfield.